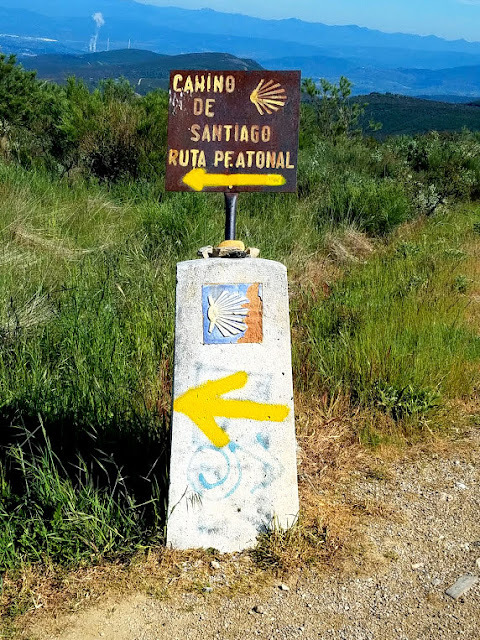 El Camino de Santiago. Photo: © Duperier's Authentic Journeys. All photos are copyrighted as attrributed. Unauthorized use is prohibited. 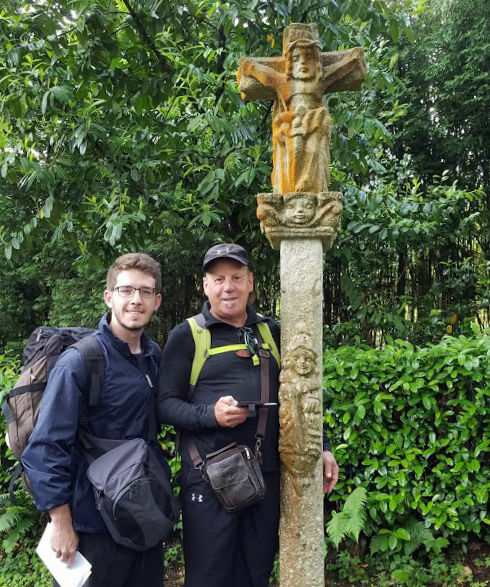 Have you ever dreamed of going on pilgrimage along the Camino de Santiago but were concerned with the prospects of going it alone, spending the night in hostels with strangers, or dining from the pilgrim menus? While that may represent the true pilgrim experience to the purists, of whom I have the utmost respect, it is not the “way” for everyone. There is another. If I have piqued your curiosity, then keep reading. Now imagine that same pilgrimage with all the logistics of accommodations, meals, Camino guides and transportation managed for you in one convenient package, the ultimate “way” so to speak; freeing your mind, body and soul to embrace your spiritual journey. When you travel with Duperier’s Authentic Journeys, it doesn’t get more convenient or authentic. 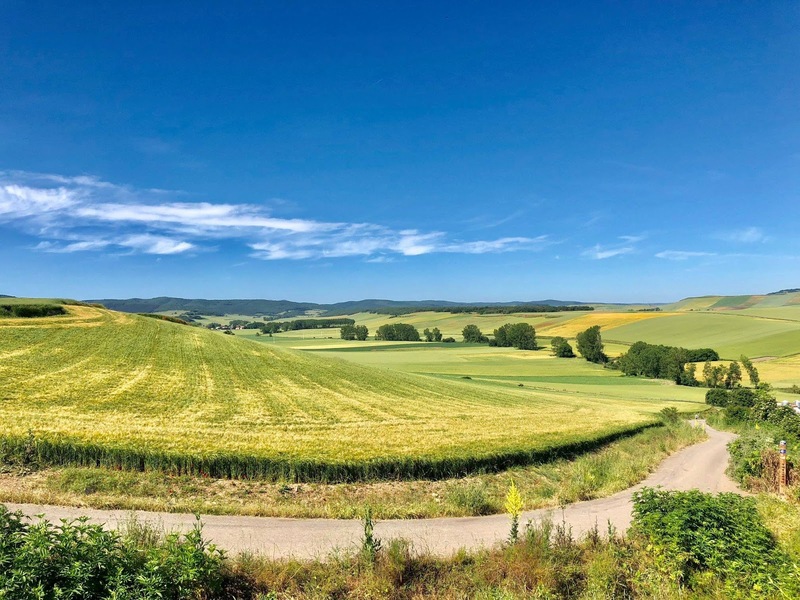 The tour company hosts two guided tours along the Camino every year: from Roncesvalles to Burgos and from León to Santiago; the latter of which I will embark in the coming weeks. Did I mention the deluxe accommodations and gourmet cuisine that pilgrims enjoy every step of the way? Epicurean delights nourish hungry pilgrims every day along the sacred path. Photo: © Lisa Foradori. Juan-Carlos Duperier. Photo: © Lisa Foradori. “What if I brought people to the Camino to make them happy like me? 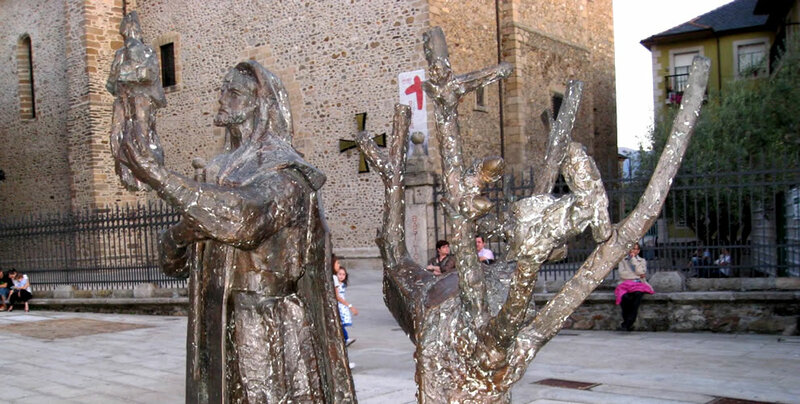 So, the idea of bringing people to the Camino was actually born on the Camino. And from that idea came Authentic Journeys. I feel good about enabling people to discover the beauty and power of the Camino,” said JC in a recent interview with Hélène Stelian. The sacred path from León to Santiago de Compostela begins here. 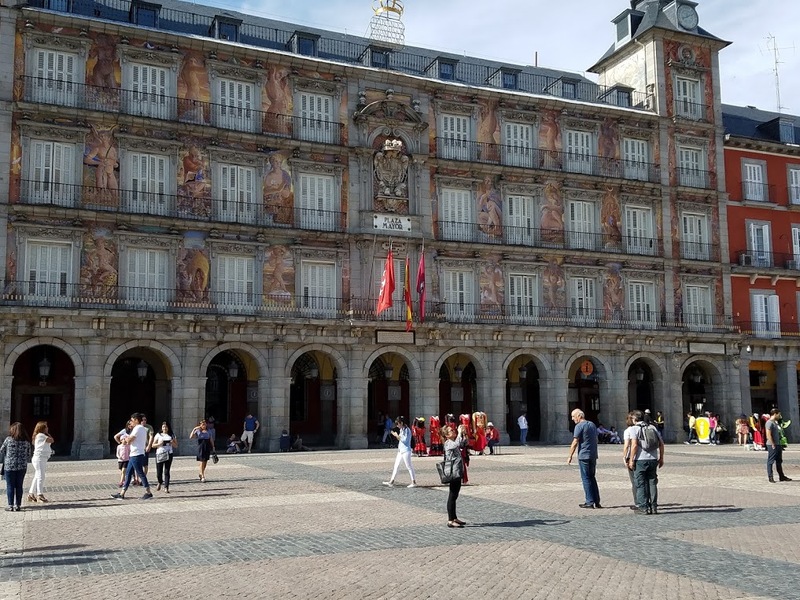 Actually, my authentic journey begins in the Spanish capital of Madrid, one of the optional tour extensions Authentic Journeys offers for a deeper cultural immersion. 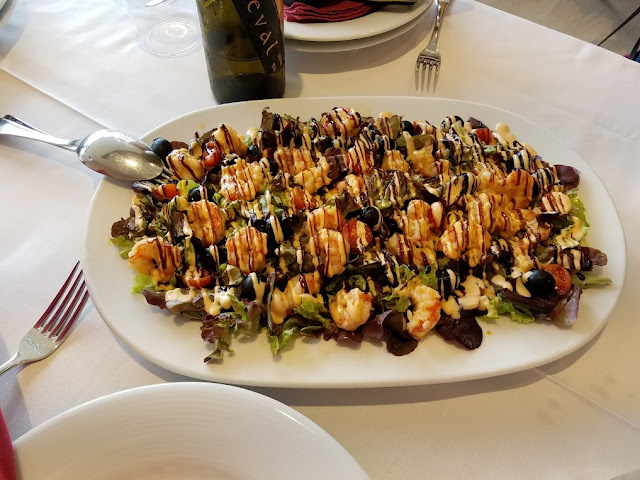 By day, we will tour the city center of Old Madrid and visit some of the prominent landmarks including the Plaza el Mayor, the Mercado de San Miguel to indulge in a few pintxos y tapas and one of the highlights will be a visit to Miguel de Cervantes’ home where I may even meet Don Quixote himself. I hope so. By night, we attend the pilgrim’s welcome dinner with JC where we’ll share a toast and break bread with our fellow peregrinos. 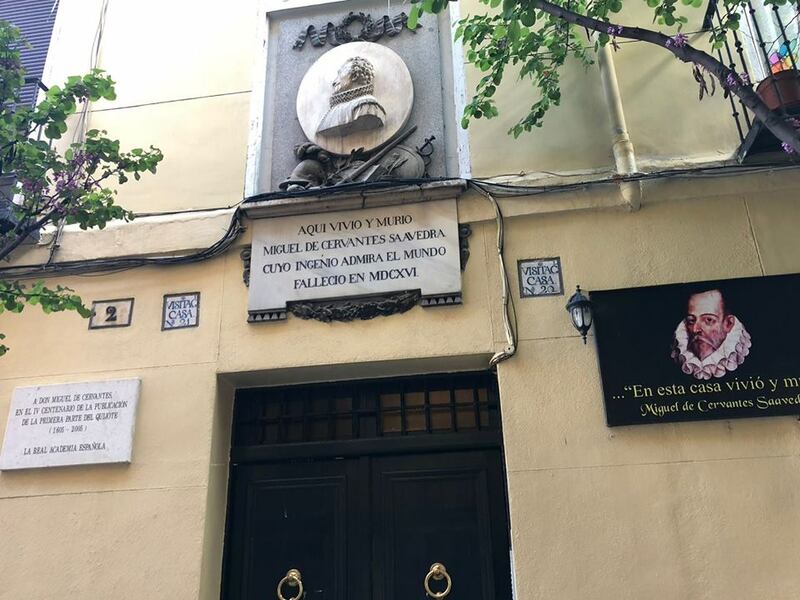 Miguel de Cervantes' house in Madrid, Spain. I wonder if Don Quixote is home. Photo: © Duperier's Authentic Journeys. .
Madrid's Plaza Mayor. Photo: © Lisa Foradori. After our transfer from Madrid in the morning, we’ll begin to settle into the pilgrim’s way of life, or should I say a “privileged” pilgrim’s life with a tour of the city. The magnificent León Cathedral. Photo: © Lisa Foradori. 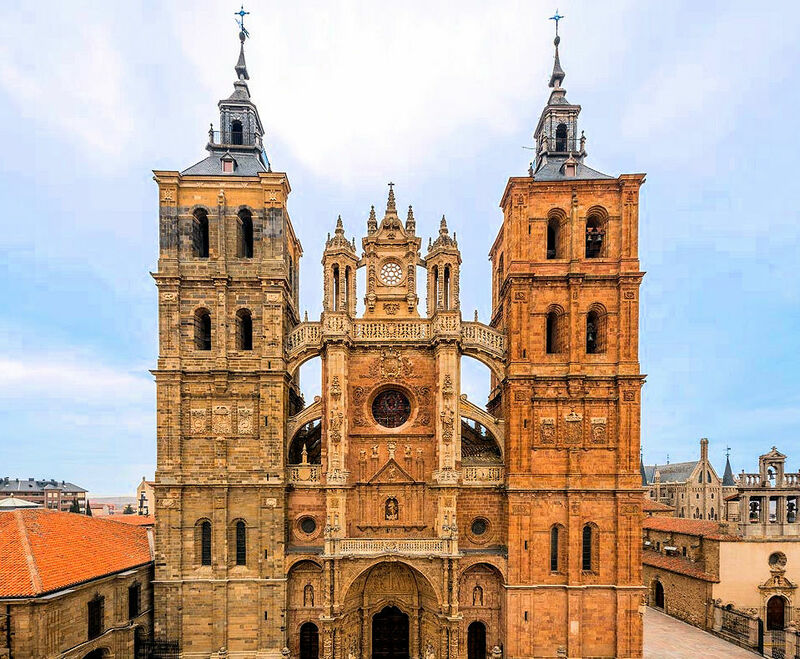 Dedicated to Santa María de la Regla, the León cathedral is also known as “The House of Light” or the “Pulchra Leonina,” a sublime masterpiece of the French Gothic with most of its edifice modeled after the cathedrals in Reims and Saint-Denis in France. Dating back to the 13th century, today’s cathedral was built upon ancient Roman baths from the second century and inside, a heavenly light bathes its cavernous interior with the translucent majesty of 125 stained-glass windows, most of which have survived since the 13th-15th centuries. Above the western portal, the Virgin Mary welcomes worshipers and pilgrims while Saint James himself makes an appearance to the right. Real Colegiata de San Isidoro and the royal Sistine Chapel of León? León's Real Colegiato de San Isidoro. Photo: © HotelRealColegiata.com. 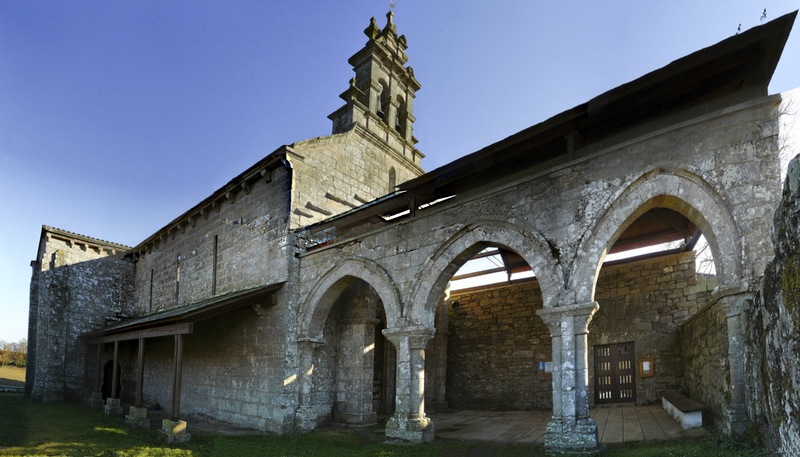 Located along the exterior south transept, la Puerta del Perdón (Door of Forgiveness) was accessed by pilgrims who were too ill to complete the journey to Santiago de Compostela. It is here that they were granted absolution for their sins. Above the door is a remarkable triptych depicting the resurrection of Christ: the central image shows Jesus being brought down from the cross; to the right, three Marys discover an empty tomb and on the left, the Ascension. The 19th-century Neo-Gothic Casa de Botines. Photo: © Lisa Foradori. Originally designed as the headquarters of a Leónese textitle company at the end of the 19th century, this Neo-Gothic architectural marvel was declared a historical monument in 1969. 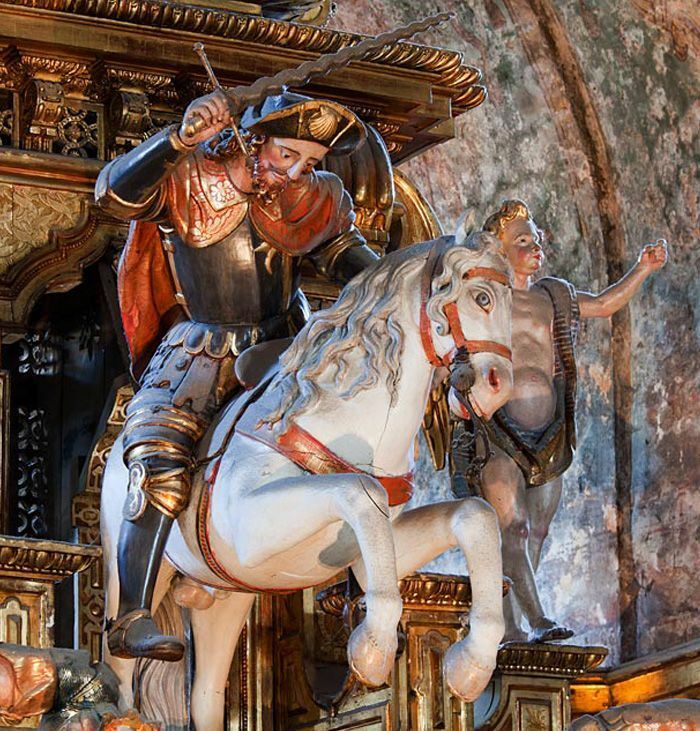 An extraordinary find was made in 1950 during restoration efforts to a sculpture of Saint George slaying his dragon that was perched above the building’s main entry. When the statue was removed, a tube was discovered inside the pedestal that contained original plans for the Casa de Botines signed by Gaudi, press clippings, manuscripts, certification of completion for the property and other related documents about the artisans who contributed to the building’s completion. We’ll bunk down tonight in the Hotel Real Colegiata de San Isidoro located within the same 11th-century complex. Tomorrow, marks the beginning of my Camino. One of many waymarks along the Camino de Santiago. Photo: © Authentic Journeys. We’ll depart León in the morning aboard our trusted Authentic Journeys transfer coach and head to Hospital de Órbigo where our walk will officially begin. 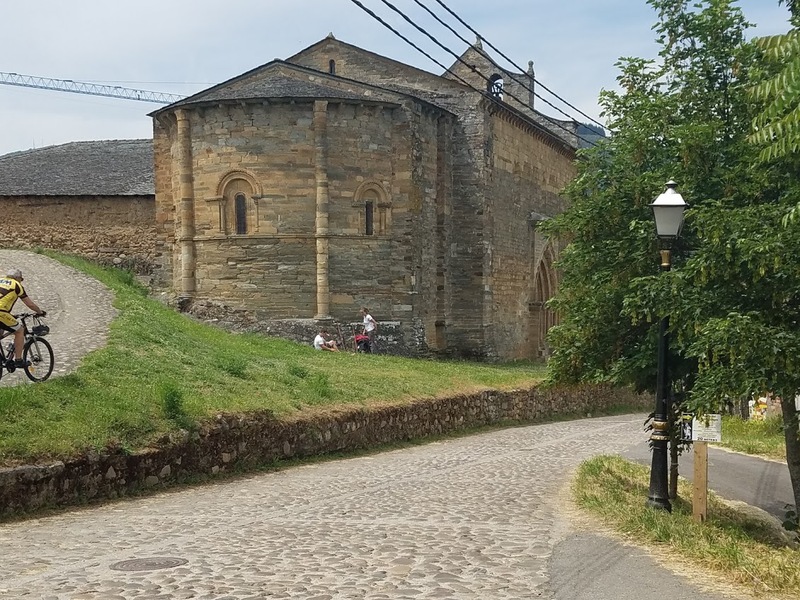 Did you know that the word “hospital” was included in many town names along the Camino because of the hospitality they provided to passing pilgrims from medical care to room and board for the night. The 13th-century Puente de Órbigo . Photo: © Lisa Foradori. 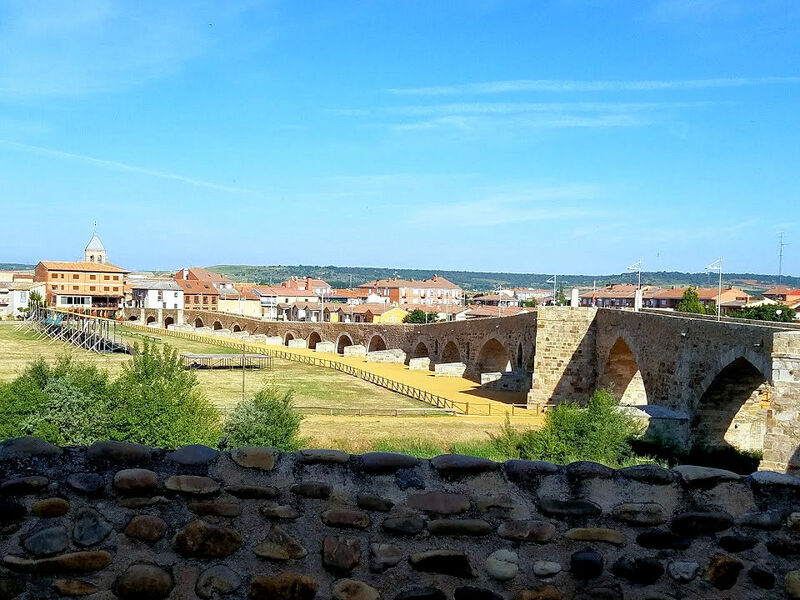 Upon our arrival in Hospital de Órbigo, we’ll begin our walk at the Puente de Órbigo, one of Spain’s best-preserved medieval bridges that dates back to the 13th century. Originally built atop a Roman bridge from even earlier times, it is known as the “Passage of Honor,” an homage to a legend about a scorned knight, Don Suero de Quiñones, who in 1434 locked his neck in an iron collar—a symbol of his tormented love; cast down his gauntlet and dared 300 knights to challenge him to a joust. After 300 successful defeats, he regained his honor and the intrepid knight made pilgrimage to Santiago to give thanks. Cruceiro Santo Toribio. Photo: © Lisa Foradori. The stone Cruceiro Santo Toribio or the Cross of Santo Toribio commemorates the location where the fifth-century Bishop Toribio of Astorga fell to his knees in a final farewell after having been banished from the village. Surrounding the cross are stunning vistas offering views of Astorga. Because of its strategic location at the crossroads of Via Trajana (the way to Bordeaux), Via de la Plata (the silver road connects with Seville), Via Aquitana (Roman Road Calzada Romana) and our very own Camino Frances; not to mention its wealth in gold deposits, Astorga attracted the attention of Rome when it was known as Asturica Augusta. But it was during the Middle Ages when its rise in popularity soared among the pilgrims due to the number of pilgrim hospitals the city offered, more than 20 at the time, and second to any location along the Camino Frances after Burgos. Astorga's Santa Maria de Astorga Cathedral. Photo: © CatedralAstorga.com. Declared a national monument in 1931, Astorga’s Santa Maria de Astorga cathedral dates back to 1471 and was constructed within the same walls that belonged to its predecessor—a Romanesque cathedral dating even earlier to the 11th century. 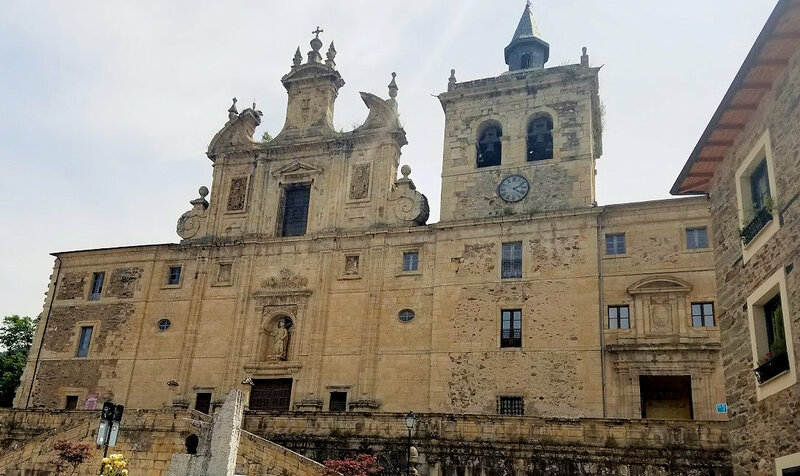 Its Baroque façade dates to the 18th century and is comprised of three portals flanked by two towers and inside, one of the most exquisite retablos (altarpiece) on the Camino completed by one of Michelangelo and Raphael’s students, Gaspar Becerra. Adjacent to the cathedral is the Iglesia de Santa Marta dedicated to Astorga’s patron saint and Christian martyr, Saint Marta and connecting the two is a 14th-century cell that used to imprison prostitutes. Inside the Museo de Cathedral is a magnificent painting, “The Bridge of Life and Queen Lupa” or “El Puente de la Vida y la Reina Lupa” that depicts bulls pulling along Saint James’ sarcophagus to his final resting place. In their pursuit are Roman soldiers whose aim is to interrupt the transport of the relics but thanks to a little divine intervention, the bridge behind them collapses ending the Romans' chase and allowing Jesus’ Apostles to continue in their mission to see Santiago’s remains safely delivered. Gaudi’s fairy-tale whimsical Bishop’s Palace in Astorga. Photo: © Authentic Journeys. Gaudi’s fairy-tale whimsical Bishop’s Palace is a classic example of Neo-Gothic architecture and only one of three Gaudi-designed edifices constructed outside Catalonia. 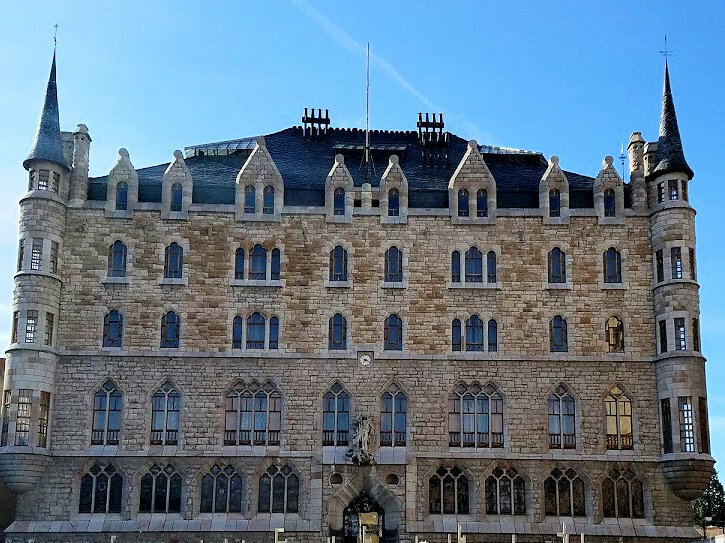 Completed in 1893, no bishops ever called the palace home, but its top floor does house the “Museum of the Ways” dedicated to pilgrims making their way to Santiago de Compostela. Inside, pilgrims can view the original iron cross that stood upon Cruz de Ferro atop Mount Irago. Can’t wait to visit this one! Other sights of interest include the Museo del Chocolate (Chocolate Museum), gold mines, Roman artifacts and ancient city walls. Accommodations for the night will be in the city center at the Hotel Via de la Plata. Cruz de Ferro or Iron Cross is one of the most poignant stops along the sacred path. Photo: © Lisa Foradori. Located atop Mount Irago at nearly the highest point along the Camino Frances and one of the most poignant stops for all pilgrims, an iron cross stands atop a weathered wooden pole, to greet all those who wander here. According to the traditions of The Way, pilgrims carry a stone, from home or picked along the path, representing a burden in their lives they wish to free themselves of. 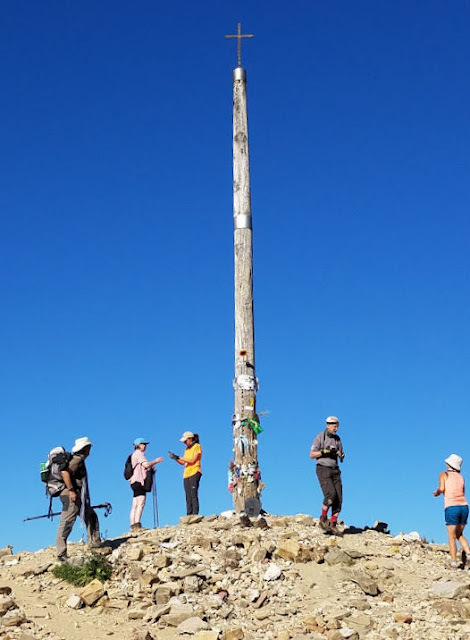 After a little introspection and with a little prayer, they toss their tokens of burden onto the great mound at the foot of the Cruz de Ferro with all those who came before them. Finally free, they begin life anew. I am sure this will mark one of the most profoundly moving moments of my pilgrimage. Waymark en route to el Bierzo. Photo: © Lisa Foradori. 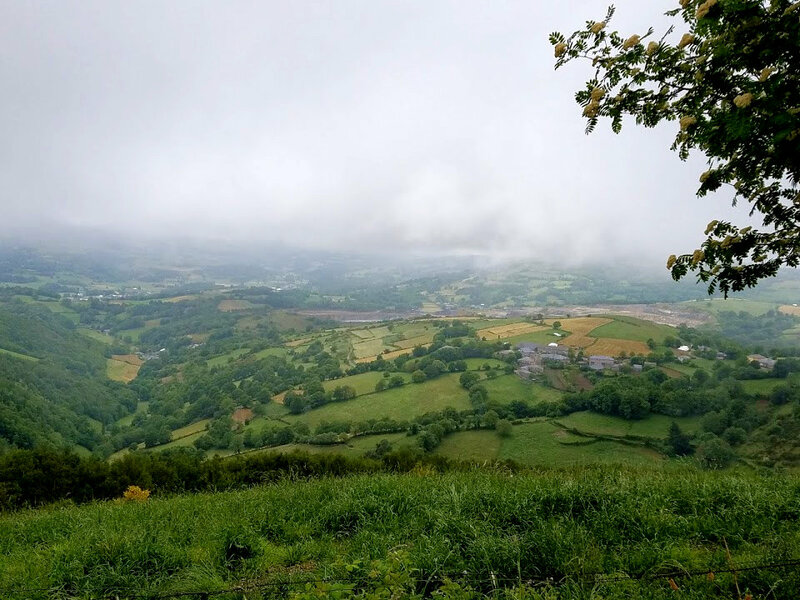 As we begin today’s walk at Cruz de Ferro, our Camino continues through the beautiful countryside and an enchanted forest to the mountain village of El Acebo, the gateway into one of Spain’s most charming regions, El Bierzo. 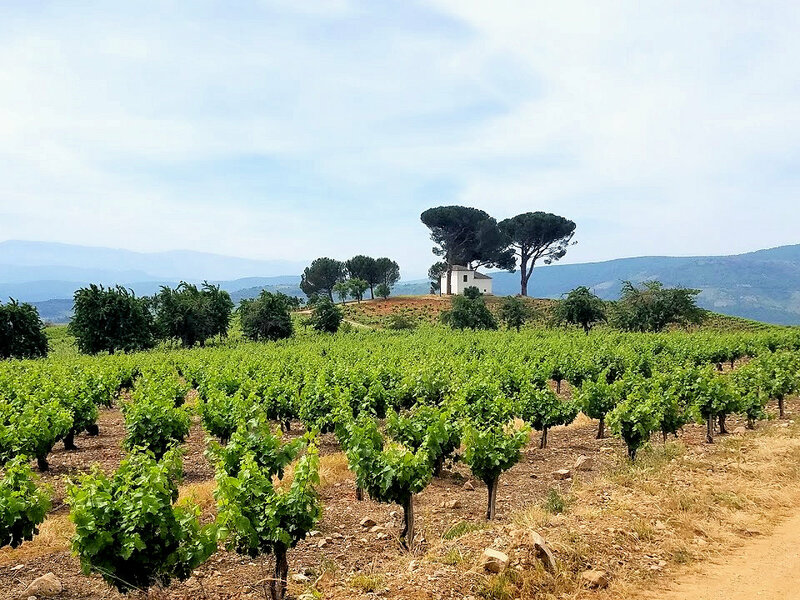 Spain’s Bierzo region is also renowned for its wines and recently earned the official designation of Denominación de Origen (DOC) by the Spanish Ministry of Agriculture, Fisheries and Food. Descending into El Acebo, Spain. Photo: © Authentic Journeys. We’ll pass through Manjarín, home to a modern-day Templar Knight, Tomás, the sole resident of the abandoned village that dates back to the 12th century and is steeped in Templar history. 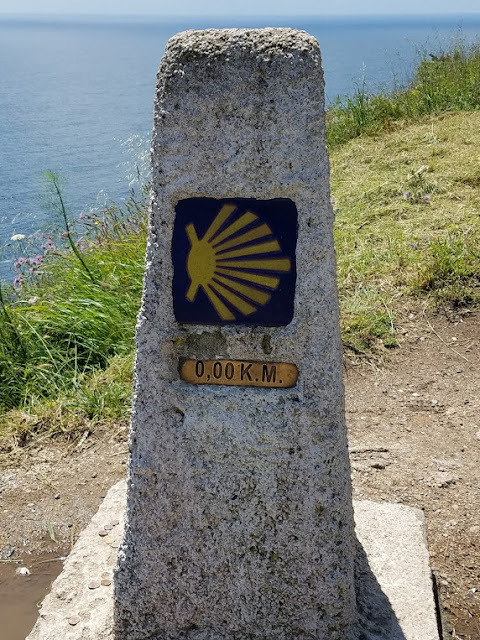 Plus, I'll be on the lookout for the brightly painted, multidirectional sign with arrows indicating distances to Santiago, Rome, Jerusalem, Finisterre—among countless others. Some of you may recognize it from the movie “The Way”! Need direction to just about anywhere in the world? Check out this sign as seen in Manjarin, Spain, as well as the movie "The Way. Photo: © Alexander Schimmeck. Following Manjarín, we’ll arrive in El Acebo and pay our respects to the statue of Santiago Peregrino at the San Miguel Church located at the northern end of the village. On approach to Molinaseca. Photo: © Lisa Foradori. 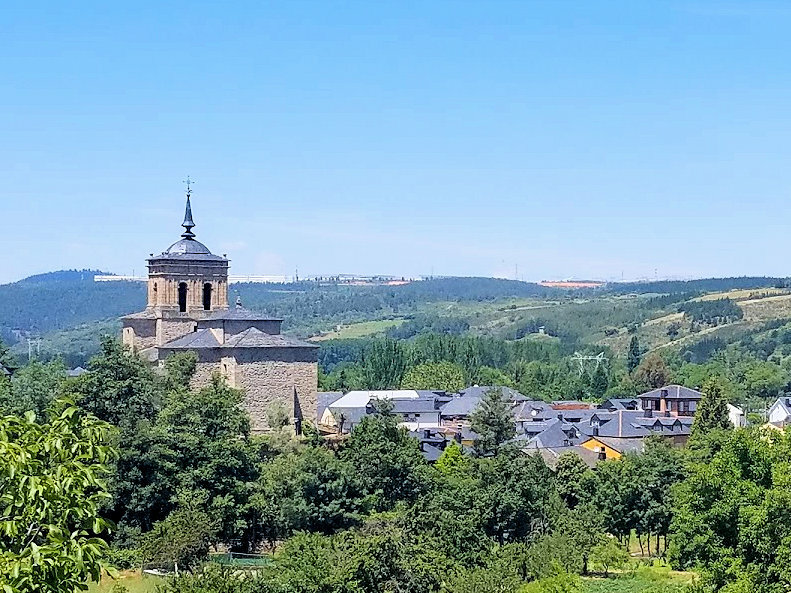 The Sanctuary of Our Lady of Sorrows or known locally as Santuario de Suestra Señora de las Angustias is constructed into the mountainside on the right side of road and whose door became a souvenir keepsake for medieval pilgrims who would shave off slivers. Today, the door is iron plated, so pilgrims ... be told. We’ll cross over Puente de Peregrinos, a medieval bridge that spans the Río Meruelo. To our left is the 17th-century San Nicolás church welcoming us to our destination for the day—Molinaseca where our pilgrim feast awaits just in time for lunch! For those of you who have read Paulo Coelho’s “The Pilgrimage,” it is here in the region of Foncebadón, where he finally defeated his demon, Legion who appeared to him as the vicious black dog as he did a few times before. 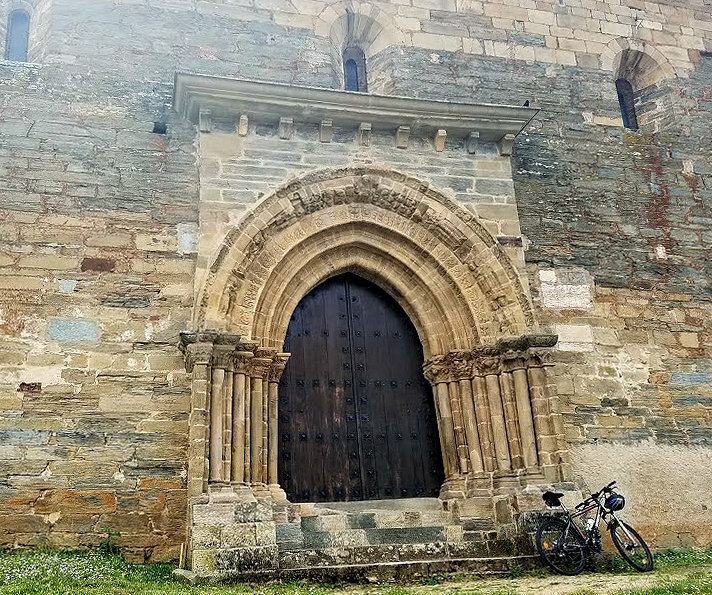 The day starts out with a tour of Ponferrada including the 12th-century “Castillo Templario de Ponferrada” or Templar castle built upon the vestiges of a Visigoth fort, a Roman fort and a Celtic settlement. Today, it's home to the Templar Library, not to mention a host of mysterious symbols—chief among them the castle's 12 towers believed to represent the Twelve Apostles or constellations according to their geometric layout. I am sure the place holds many more secrets awaiting a pilgrim's discovery. Castillo Templario de Ponnferrada or Templar Castle was built in the 12th century. Photo: David 820 CC BY-SA 3.0 es from Wikimedia Commons. 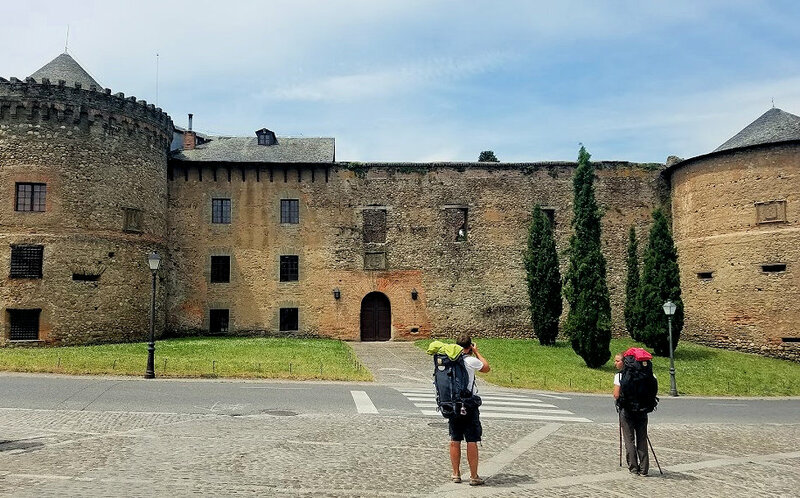 Did you know King Ferdinand II ordered the construction of the castle in 1178 to protect the pilgrims along the Camino de Santiago? Actually, the town’s name, Ponferrada, derives from the Latin "pons" and "ferrum" (bridge and iron) because of the iron supports used to construct and reinforce the 11th-century bridge, an usual building technique back in the day. For all of you who remember the Periodic Table from chemistry class, you know that “Fe” is the symbol for iron as well. Our Lady of Oak statue commemorates the miracle. Photo: © BasilicadelaEncina.es. Basilica de Santa Mariá de Encina (Our Lady of the Oak) so consecrated because it houses a statue of Mary, originally from Astorga but hidden inside an oak tree in the eighth century because of the Muslim invasions. During the 12th century when lumber jacks were felling trees for the nearby Templar castle, the statue was discovered inside one of them, and the church was built upon that very location of the miracle. Outside the church, a statue commemorating the miracle was erected. Following the morning tour, it’s off to Camponaraya where today’s walk begins. The original 10th-century apse of the Iglesia de Santa María or Church of Saint Mary houses a Baroque statue of the Virgin. The town also features a museum of Roman artifacts discovered in nearby settlements as well as a wine museum showcasing the the region’s wine production. An old mill and olive press are among the sights to see as well. We continue to follow our sacred path until we reach the white house on the horizon ... the gateway to our destination for the day. En route to Villafranca del Bierzo. Photo: © Lisa Foradori. Iglesia de Santiago (Church of Saint James). Photo: © Lisa. Foradori. The 12th-century Iglesia de Santiago (Church of Saint James) welcomes pilgrims through yet another Puerta del Perdón or Door of Forgiveness. In the same traditions as Real Colegiata de San Isidoro in León mentioned above, the Church of Santiago offered absolution and the Compostela certificate to pilgrims who were too ill and unable to continue the trek to Santiago, hence its nickname “Little Santiago.” Inside, a statue of Saint James dressed in his finest pilgrim duds awaits. Puerta del Perdón or Door of Forgiveness. Photo: © Lisa. Foradori. Monasterio de San Francisco dates back to the 13th century and according to some, founded by Saint Francis of Assisi himself. The edifice combines Romanesque, Gothic and Baroque architectural styles due to the number of additions and restorations over the last 800 years. Saint Nicholas Church. Photo: © Lisa Foradori. Castillo-Palacio de los Marqueses. Photo: © Lisa Foradori. The Castillo-Palacio de los Marqueses (Castle/Palace of the Marquises) standing today was constructed atop a former castle destroyed in 1507 by an illegitimate son of Pedro Álvarez Osorio. Its predecessor was built in 1515 under the order of his wife Beatriz de Castilla. More of a fortified palace than castle, it fell to the English in 1809, then to the French in 1815 and 1819 during the Independence War. Today the Villafranca del Bierzo Castle is privately owned by the Marques of Villafranca. We’ll bunk down for the night at the Palacio de Canedo winery owned by Señor Prado a Tope in the heart of the Bierzo’s wine region. Of course there will be a tasting followed by a scrumptious dinner. 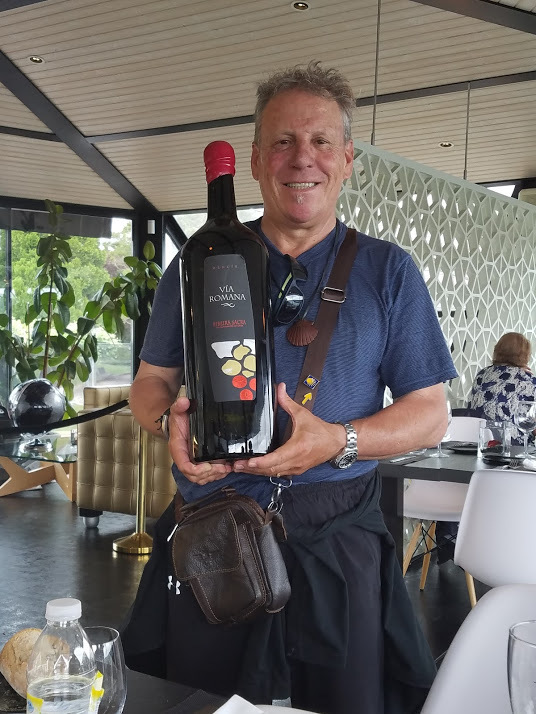 Palacio de Canedo Winery. Photo: © Pradaatope.com. Vineyard view from the Palacio de Canedo Winery. Photo: © Authentic Journeys. Galicia (ga-lee-thee-uh), home to Santiago de Compostela. According to the three stages of the Camino Frances route (Saint-Jean-Pied-de-Port to Santiago de Compostela), Galicia, steeped in Celtic traditions and reminiscent of western Ireland, represents the last stage—spiritual rebirth. As mentioned in an earlier article, the first stage—“physical” transformation tests your endurance when crossing over the Pyrenees; the “emotional” transformation happens along the monotonous Maseta allowing plenty of time for introspection. But it is the third and final stage where pilgrims experience a “spiritual” transformation. With roots dating back to megalithic prehistoric cultures as evidenced by ancient burial chambers discovered throughout the region, Galicia was first settled by the Celts who would eventually become known as Galicians and these inhabitants established settlements that remained occupied until the end of the first millennium. 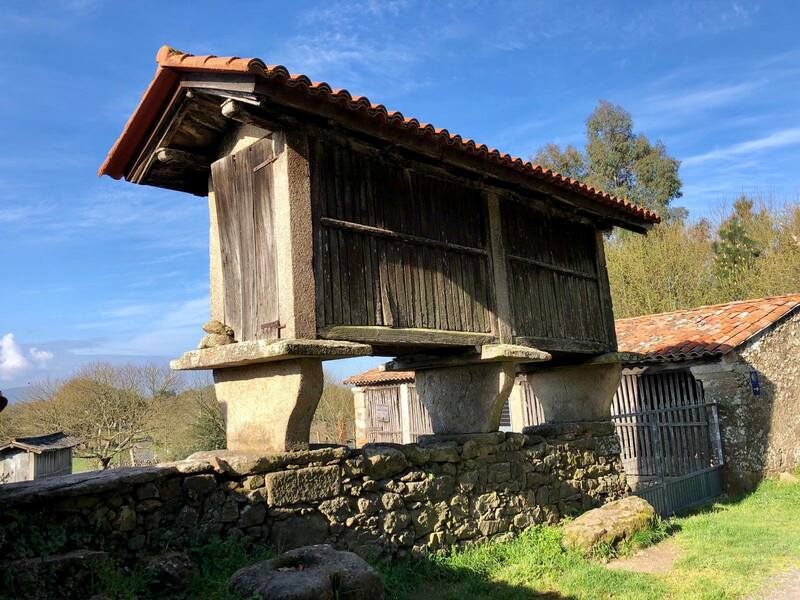 Hórreos are raised corn granaries that date back to the 15th century and can be seen throughout Galicia. Photo: © Authentic Journeys. We begin the day with a drive to O’Cebreiro (oh thay bray AIR oh) and along the way, we’ll be on the lookout for “pallozas” and “hórreos (or-e-oh)” dotting the landscapes, the former of which are Celtic circular thatched-stone houses and the latter, raised corn granaries that date back to the 15th century and uniquely designed with slate bottoms that extend beyond the walls of the structures making it impossible for rodents to scavenge the harvests. Iglesia de Santa Maria Real (Royal Saint Mary’s Church) is just one of the many sites where miracles occurred along the Camino. Photo: © Amaianos (Wikimedia.org). 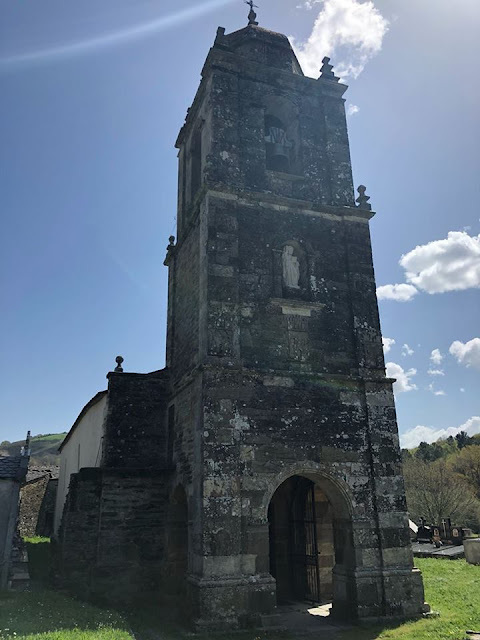 We’ll also visit the oldest extant church along the Camino, the Iglesia de Santa Maria Real (Royal Saint Mary’s Church) dating back to the ninth century although much of what we see today is the result of reconstruction efforts that took place after a fire ravaged the church in the 19th century. During restoration, vestiges of a pre-Romanesque basilica were discovered as well. But this church is also renowned along the Camino as the site where the Eucharistic Miracle of O’Cebreiro came to pass one snowy evening during Mass when the priest scoffed at a peasant for braving the winter storm to attend the services. According to the documents recording the miracle, the Host and wine offered to the devout worshiper miraculously transformed into the flesh and blood of Jesus Christ in order to restore the faith of the priest who had lost his way and was not convinced they embodied Christ! According to one of my guidebooks, the statue of Saint Mary inclined her head toward the miraculous event. Thousands of pilgrims pay their respects inside the little chapel. Photo: © Authentic Journeys. Today, the Sacred Relics (chalice and blood-stained parament) are housed inside a chapel (pictured above). Of course, thousands of pilgrims pay their respects every year and for this pilgrim, I can hardly wait until my visit. The church is also the final resting place of Father Don Elias Valiña Sampedro (1929-1989), a priest who not only dedicated his life restoring and preserving the traditions of the Way of Saint James, but also established the ubiquitous yellow arrows that guide pilgrims along the Camino de Santiago. I plan to seek out the statue of his bust in the church square and many my respects along with thousands who have come before me. 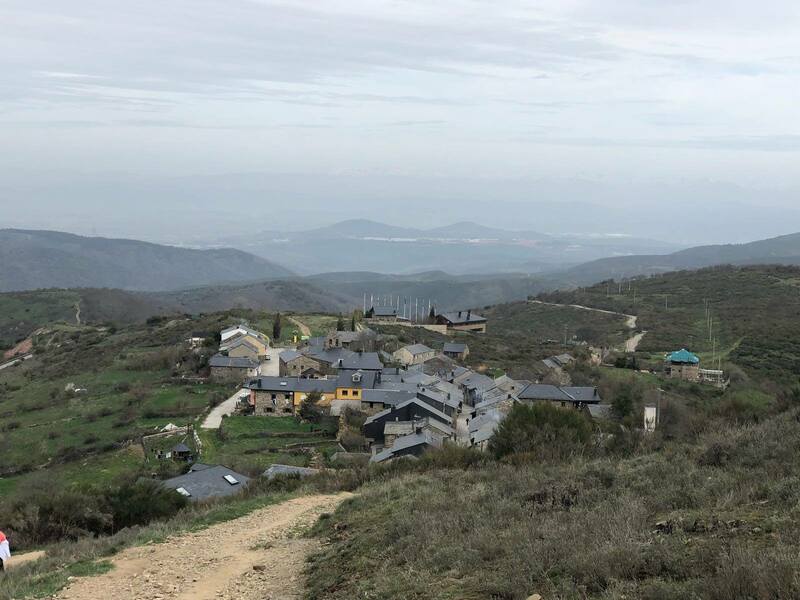 Our coachman will take us to Alto de Poio, THE highest point along the Camino de Santiago with Mount Irago (Cruz de Ferro) running close behind, where we’ll begin our walk for the day. Our destination will be Tricastela or City of Three Castles. It's Day 6 for our itinerant pilgrims and we begin the day in Triacastela. Barely any remnants of the eponymous three 10th-century castles remain today save the stone etchings on the tower of the Iglesia de Santiago, the parish church of Triacastela; and city’s coat of arms. In these, their memory shall live forever preserved for generations to come. Look carefully in the picture above, just below the niche with statue of Santiago Peregrino and you will see three castle reliefs. Tricastela Tower with bas relief of three castles below the statue of Santiago Peregrino. Photo: © Authentic Journeys. 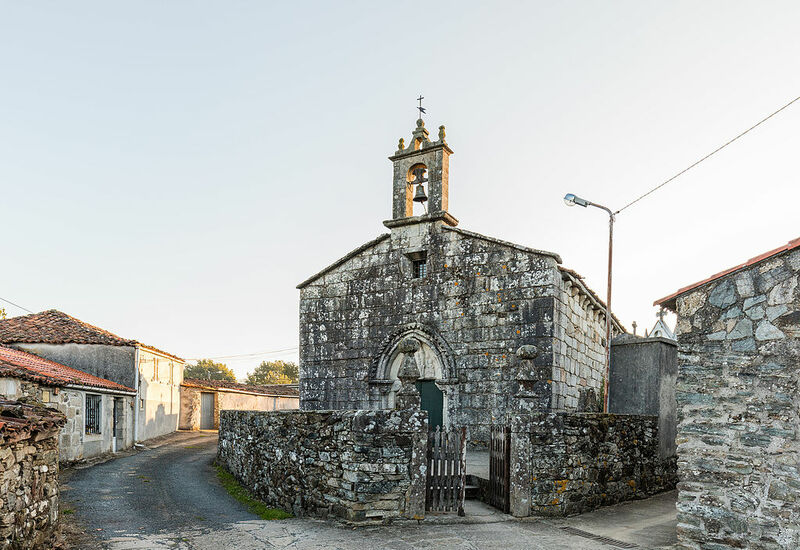 At this point along the Camino, pilgrims can opt for one of two routes that eventually merge again near Aguiada: via San Xil is the more direct route but via San Samos is worth the additional 6.5 km. because of its beautiful countryside and rural landscapes, plus its main attraction—the Monastery of San Xulián (Saint Julian) of Samos, a Benedictine Monastery founded in the sixth century and a pilgrim hospital still in operation since the 11th. Monastery of San Xulián (Saint Julian) Benedictine Monastery. Photo: © Lisa Foradori. 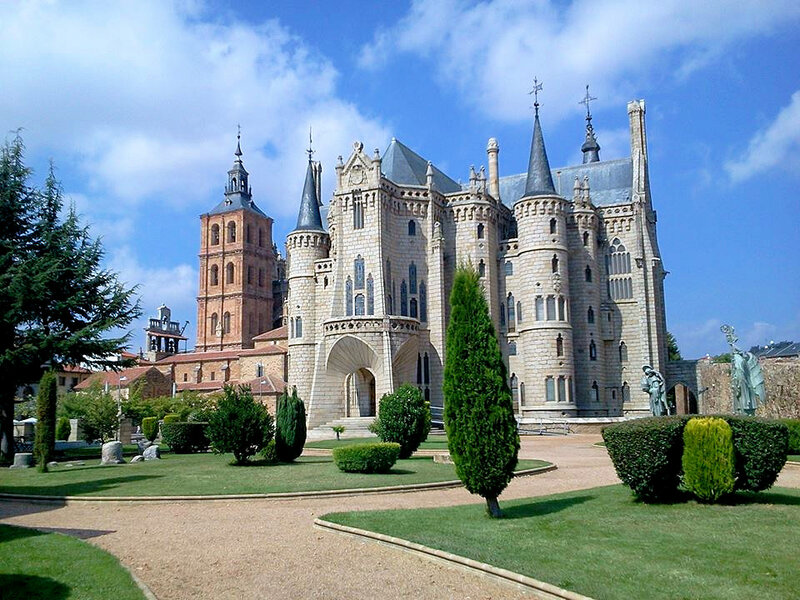 The complex combines three architectural styles from the Gothic to the Baroque due to various destructive fires that plagued the monastic buildings in the 16th and 20th centuries. Two magnificent cloisters and a library with more than 30,000 volumes are some of the main attractions not to mention the Benedictine monks who have resided here since the 10th century. The area is also known for the limestone quarries whose stone yielded blocks that eventually made their way to the construction site of the cathedral in Santiago de Compostela. 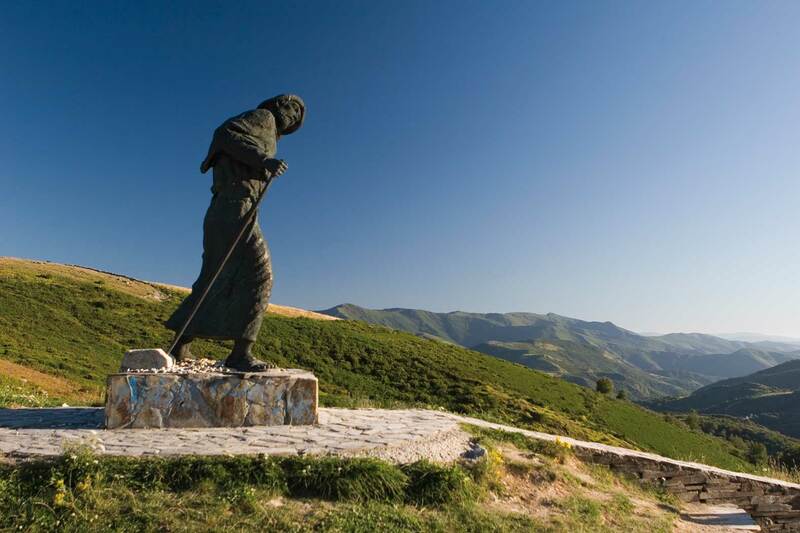 A monument of a lone pilgrim in the final stages of his Camino stands atop Alto de San Roque along LU-633. A lone pilgrim marches to Santiago de Castillo. Photo: © Xacopedia.com. 100 km to Santiago—the anticipation heightens! En route to Sarria. Photo: © Lisa Foradori. Sarria, a favorite starting point for many pilgrims because of its location—approximately 100-km. to Santiago de Compostela. To qualify for the Compostela certificate awarded by the pilgrim office there, the last 100 km. of the Camino must be completed on foot and pilgrims must have their passports stamped twice every day from this point on. At this stage along the 500-mile Camino, author John Brierley of the “Pilgrim’s Guide to the Camino de Santiago” offers this sage advice to all the “seasoned” pilgrims who began their journey in Saint-Jean-Pied-de-Port or points further away. Iglesia De Santa Mariña XIX (Church of Saint Marina) dates back to the 12th century but the edifice we see today was constructed in the 19th century due to the collapse of its predecessor. Decorating its supporting wall on the right side of the church is a captivating mural depicting pilgrims en route to Santiago de Compostela. The Church of Saint Salvador (Iglesia de San Salvador) is a Gothic church dating back to the 13th century with its original apse and two portals still intact. Its northern doors open to the Way of Saint James. On the right side of Rúa Maior at the edge of town stands the Monasterio de la Magdalena currently belonging to the Mercedarian Fathers. Founded at the beginning of the 13th century by the Italian monks of the Order of the Blessed Martyrs of Jesus who were also pilgrims, the monastery is a composite of various architectural styles dating back to the 15th-18th centuries. Originally opened as a pilgrim’s hospital, it presently comprises a church, a quaint cloister and a private school still in operation today. On our way to Peruscallo from Sarria in the morning, we’ll stop at the Romanesque Church of Santiago in Barbedelo, now considered a national monument. Founded in 1009, the church stands in the Mosteiro reminding us of its earlier days as a monastery at the end of the ninth century. On the left side of the exquisite altarpiece stands a statue of the Camino’s patron saint, Saint James, donning a red sash. Also preserved within the church are the vestiges of an old Benedictine priory. Looking forward to exploring these remnants of the past. Following our visit to the church, we begin today’s walk in Peruscallo and will continue our pilgrimage to Portomarin. View of the Belesar Reservoir that now covers the original site of Portomarin. Photo: © Authentic Journeys. 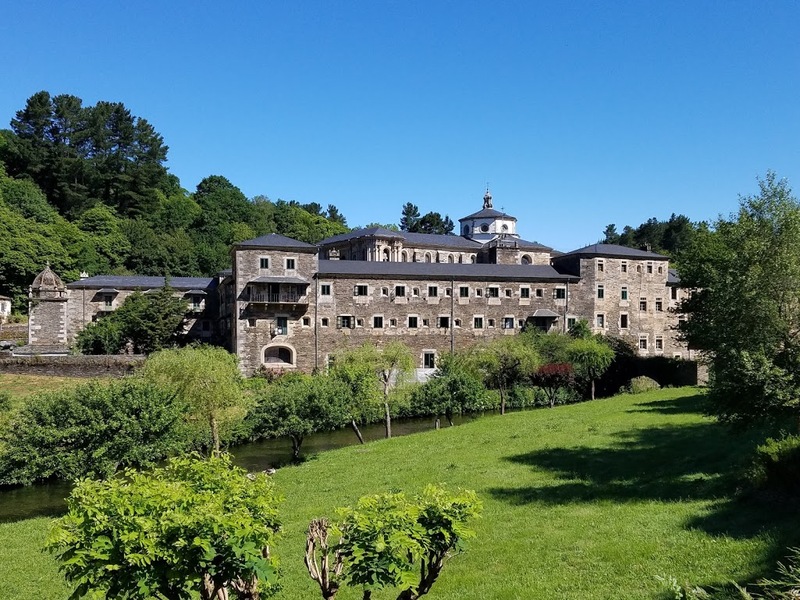 Dating back to the 10th century and victim of a number of battles that destroyed many bridges spanning the Miño River, Portomarin initially fell under the protection of Order of Santiago and later to the Order of San Juan de Jerusalén. The town was popular among pilgrims including the royals, King Ferdinand and Queen Isabella. 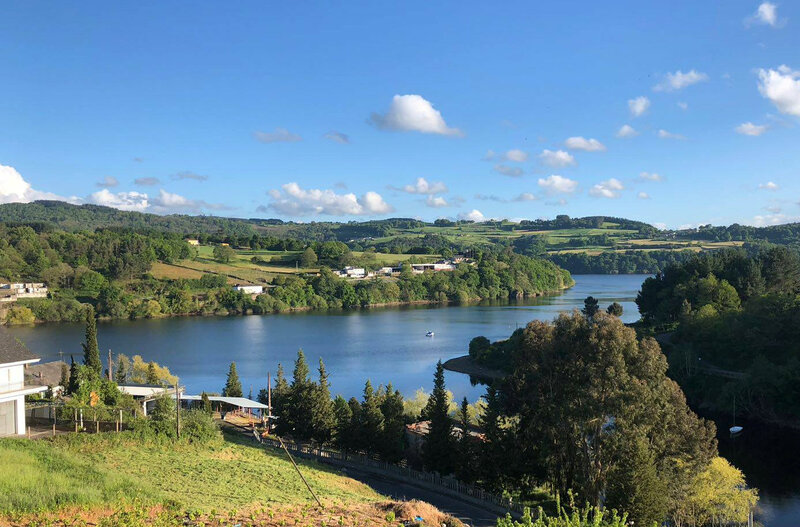 While the city may seem to be centuries old, its present-day incarnation only dates to 1960s when the Miño River was dammed to create the Belesar Reservoir (Encoro de Belesar), flooding the ancient town of Portomarin including a Roman bridge. When the reservoir is low, you can see the remnants that usually lie submerged in water. When the water levels drop below normal in the Belesar Reservoir, the adjacent Roman bridge, normally covered, emerges alongside its modern-day successor as seen in the photo above. Photo: © Fritz. However, all was not lost as the Romanesque Church of San Xoán or Church of Saint John (aka Nicholas); the dual-purpose structure built as a house of worship and a fortress, the latter evidenced by its four crenellated towers, was relocated brick by brick from its underwater grave to its present-day location. 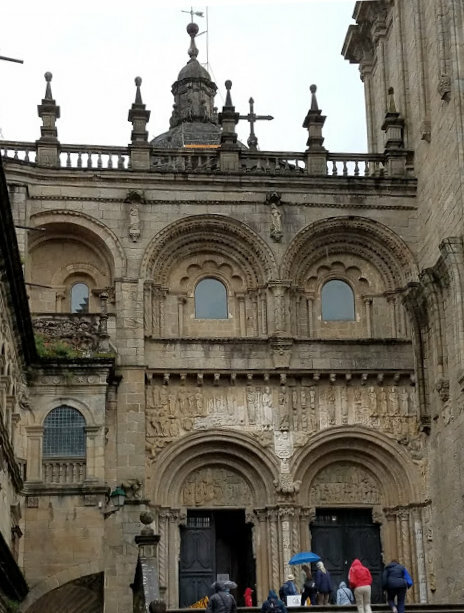 Note the portal was designed and built by Master Mateo, the famous architect who also designed the Pórtico de Gloria the Santiago de Compostela cathedral. 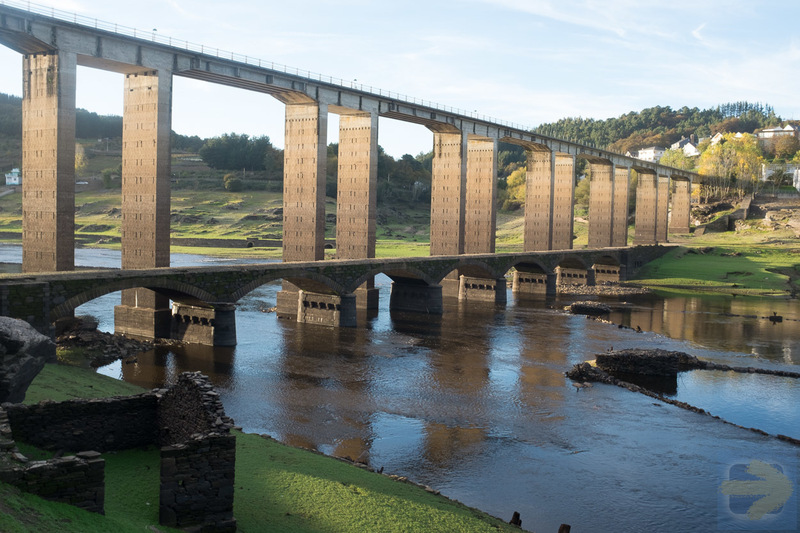 Other historic monuments were moved as well including the Santa Maria de las Nieves built on the site of a former pilgrim hospital and accessed via the stone staircase, the last vestige of the second-century Roman bridge that spanned the River Miño. According to local legend, Portomarin residents believed that the Virgin of the Snows (Virgen de las Nieves) protected them from drowning so they erected a shrine across the old bridge. When the dam was constructed in the 60s, both the bridge and the shrine were moved to their new location in Portomarin's new city centre. At the top of staircase, turn left onto the Camino or right into the city centre. Authentic Journeys pilgrims at the base of the stairs leading to Our Lady of the Snows. Photo: © Authentic Journeys. 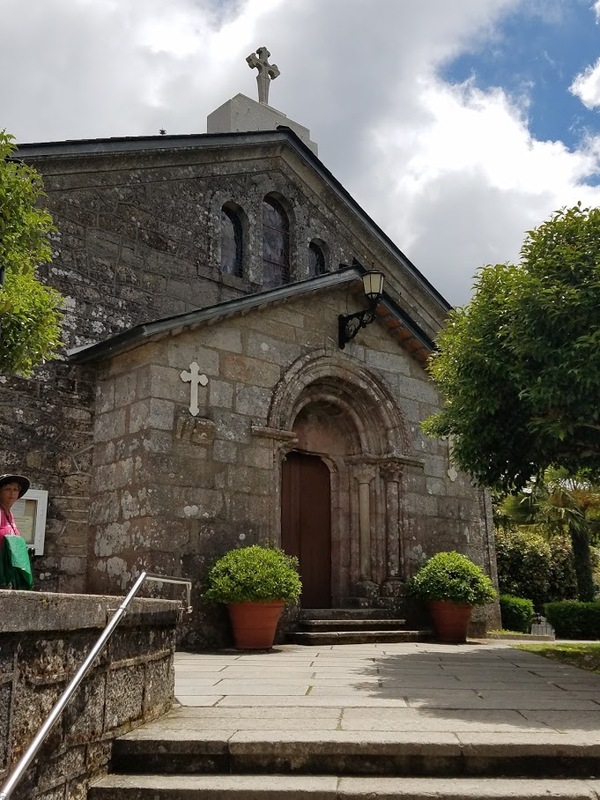 After wending our way through enchanting Galician villages, we'll begin today's walk in Hospital de Cruz and then meander through eucalyptus forests on our way to Palas to Rei where the renowned white wine of Galicia, Albariño, awaits our thirsty pilgrims. From our starting point in Hospital de Cruz, we’ll begin our overall descent into Palas de Rei however, in between, we’ll have negligible climbs to Sierra Ligonde, the highest point on today’s walk; down to Portos where I plan to make a detour (see below); and after a short climb to Alto Rosario, we'll arive in Palas de Rei. Ventas de Narón—the site of a brutal battle between the Moors and Christians. Eirexe (Airexe)—with its Camino-side Galician cruceiro (stone cross) that dates back to 1670 and the 13th-century Iglesía de Santiago. After this point in time, we’ll soon be venturing through those enchanting Eucalyptus forests. Rosario—Traditions of the Way dictated that pilgrims should to recite their rosaries while passing through this area. Eucalyptus trees were first imported from Australia in 1865 and used in construction, however, since the wood was inferior to stronger species, it is now primarily used for paper production of which most is shipped to mills in Portugal. 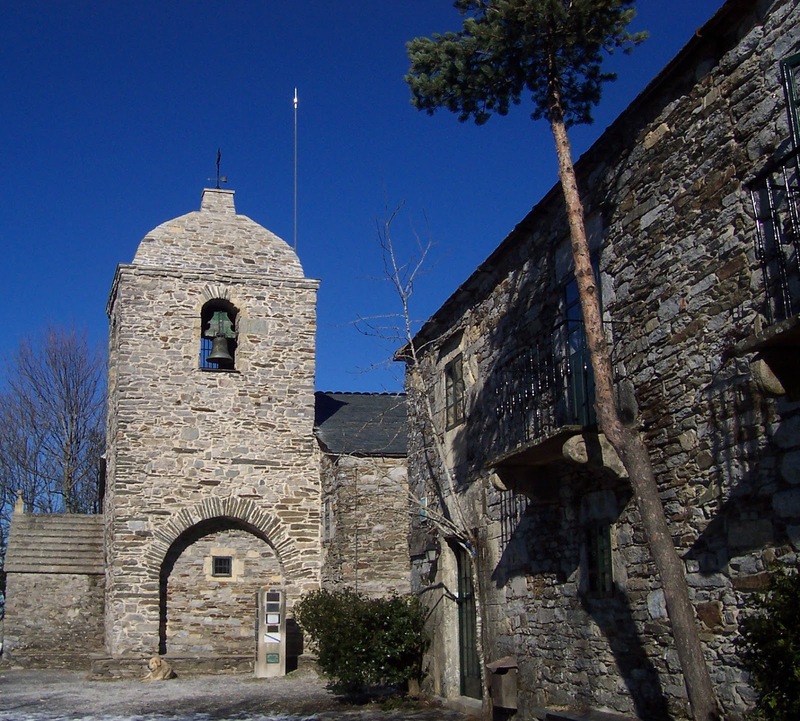 Iglesía de San Salvador de Vilar de Donas. Photo: © Soul aka Alma (CC). Near the end of today’s route, I am hoping to detour to a church with a remarkable history—the Iglesía de San Salvador de Vilar de Donas (Church of San Salvador), a national monument that also was the seat of the Knights of Santiago whose duties were to protect the Pilgrims of the Way. The church dates back to 1224, its predecessor even earlier to a 10th century convent—hence “Donas” in its name. Inside stone effigies of knights and recently restored frescoes decorate this chapel that can trace its roots back to Ireland and Scotland based on the stone carvings throughout the structure. Its exterior portal features an Irish monk (identified by his tonsure) and thistles—Scotland’s official flower. Within its walls, hangs the Cross of Saint Columbano, an Irish monk who evangelized Christianity throughout this region of Spain. This symbol which celebrates consecration appears quite often in places of worship. 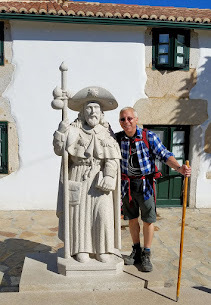 It's Day 9 as our pilgrim troupe travels from Palas de Rei to Melide. Palas de Rei owes its name to “Pallatium regis,” the palace of a Visigoth King Witiza who reigned from 702-710. 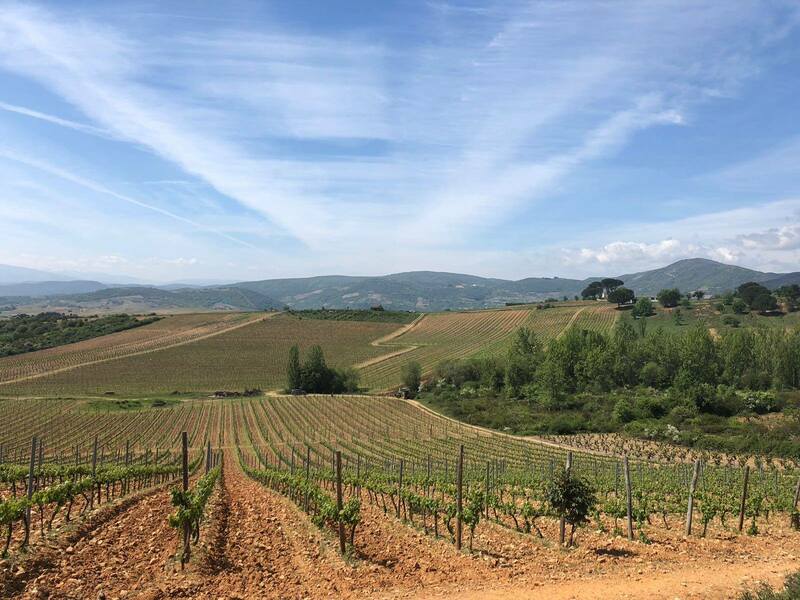 According to legend, he built a palace in this little village whose main attraction is the Romanesque Church of San Tirso rooted in the 12th century. Actually, only its front façade is original with the rest of the church constructed over the centuries that followed including the bell tower recently restored in the middle of the 20th century. Church of San Tirso. Photo: © Lisa Foradori. As we continue along the Camino, the next stop is San Xulián. The 12th-century Romanesque stone chapel of Iglesia de San Xulián was significantly reconstructed in the 18th century and named after the saint whose history is a particularly sad story to recount. According to legend, the night when Julian was born, his father witnessed an event in which two witches cursed the child and said that one day, he would grow up to murder his parents. Early in his youth, Julian was out hunting when a deer warned him of his destiny so he moved to Galicia, as far away from his parents as he could. Later in his life, his parents went on pilgrimage and coincidentally sought refuge in Julian’s house one night while he was still out hunting. Not knowing who these pilgrims were, Julian’s wife welcomed them into their home. When Julian finally returned home that night, he found two people sleeping in his bed and thought it was his wife and a lover. Outraged by the incident, he stabbed them to death. 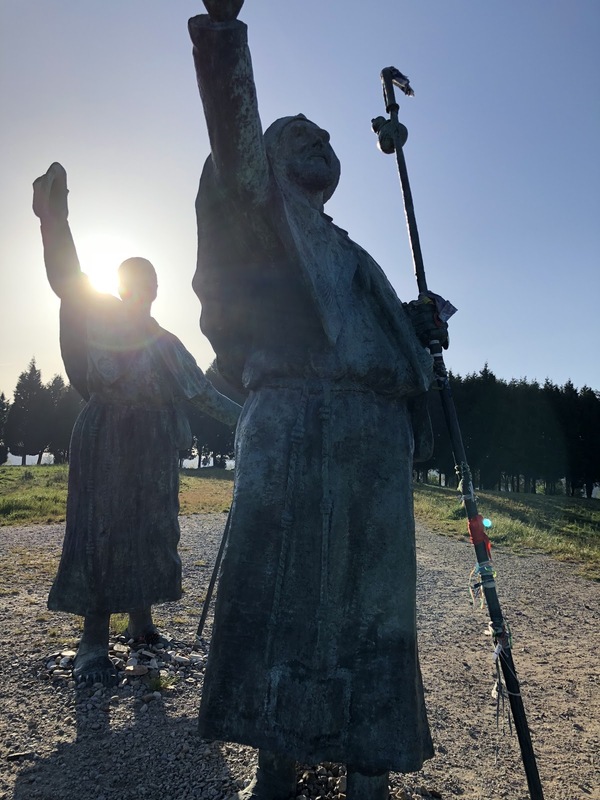 Once he realized what he had done, he went in search of penance for his mortal sins and in doing so, dedicated his life to providing refuge for Camino pilgrims. Before his death, he built seven pilgrim hospitals. Iglesía de Santa María (Church of Saint Mary) in Leboeiro. Photo: © Diego Delso via Wikimedia Commons. 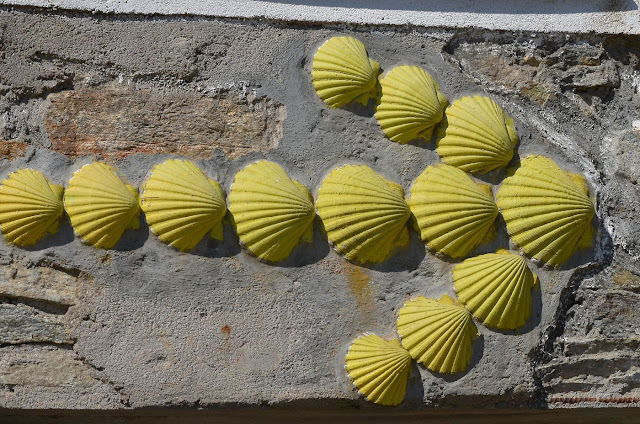 They say miracles happen every day along the Camino de Santiago even in the town of Leboreiro. One night, a radiant light and redolent aroma emanated from the village fountain and when villagers started to gather, they witnessed a miracle—an image of Mary appeared before them. Excitedly, they moved the image to the nearby church only to find later that Mary decided to return to the fountain the next day. The cycle repeated itself until the church was rededicated to her and upon the close of the ceremony, Mary finally remained. Inside frescoes dating back to the 15th century decorate the walls. The medieval Ponte Velha leads into the village of Furelos and the Iglesia de San Juan (Church of San Juan). We're sure to meet many new peregrinos of the bovine kind! 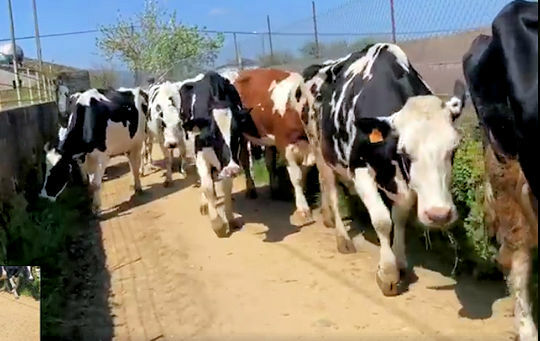 As we home in on Melide, our final walking destination for the day, we’re sure to pass some peregrinos of the bovine kind due to the fact that Arzua has one of the highest numbers of cows per capita. San Roque Church. Photo: © Turismomelide.com. Constructed not even a century ago in 1949, the Saint Roque Chapel still contains remnants of the demolished medieval churches of Saint Peter and Saint Roque. 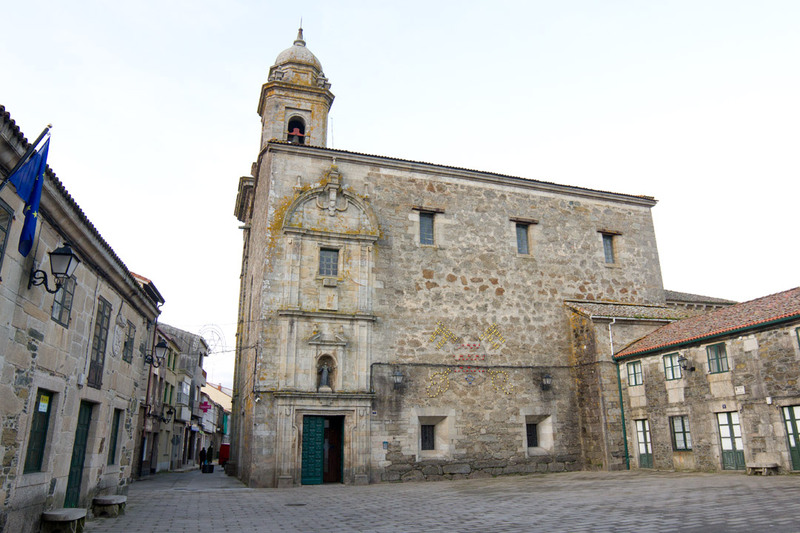 Its main façade features on one of the most beautiful in all of Galicia and actually comes from the 14th-century Saint Peter Church. 14th-century stone cross believed to be the oldest in Galicia. Photo: © Lisa Foradori. Outside the church, stands a 14th-century stone cross believed to be the oldest in Galicia. Known as the Crucero do Melide (Christ in Majesty), we see Christ holding out his pierced hands and his legs are covered. The carving on the cross although barely discernable, represents Calvary, the area just outside the walls of Jerusalem where Christ was crucified. Sancti Spiriti. Photo: © Turismomelide.com. Founded by the Franciscans in 1375, Sancti Spiritus Church located in Plaza del Convento once belonged to convent of the Third Order of Saint Francis and its Saint Christ chapel within is all that remains of the ancient convent. Decorating the walls are 16th-century frescoes that depict the mystery of the Trinity as the “Throne of Grace,” and at the altar stands the 18th-century Virgin of Mercy. The church itself was built from the ruins of the 14th-century fortress and city walls that were later destroyed a century later. Further additions were added during the 18th century. On the other side of the plaza stands the original pilgrim refuge that dates back to 1502—Antigo Hospital de Peregrinos. Today, it’s a museum and I'll be sure to stop by. 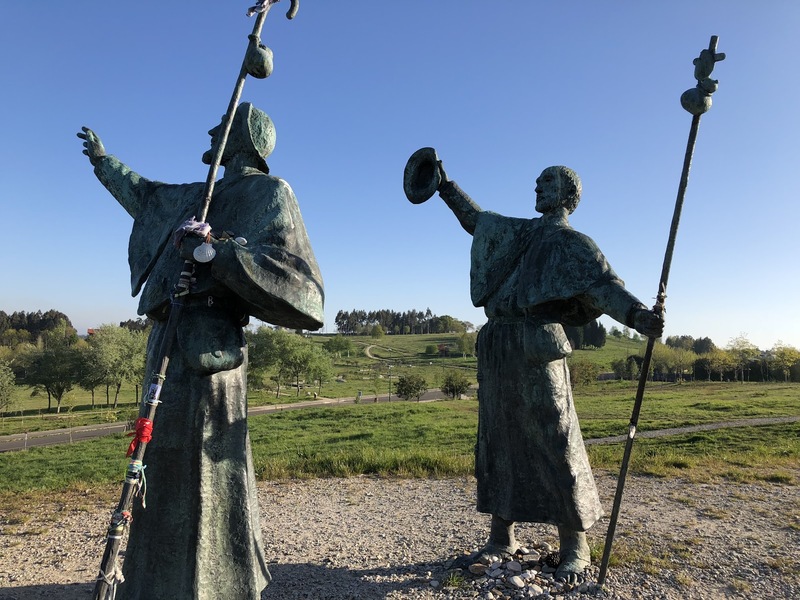 Did you know that it is here in Melide where the pilgrims of the Camino Frances meet the pilgrims of the Camino Primitivo, and together they walk on to Santiago de Compostela. If you remember, the Camino Frances begins in Saint-Jean-Pied-de-Port, France, the Primitivo begins in Oveido, Spain. The day begins with a transfer to Ras and from there, it’s only 6 miles to Santiago through dense forests of eucalyptus and pine—a peaceful, shady retreat from the Galician sun. But it’s not only the promise of a respite that pilgrims enjoy, there’s a sense of something else in the air. 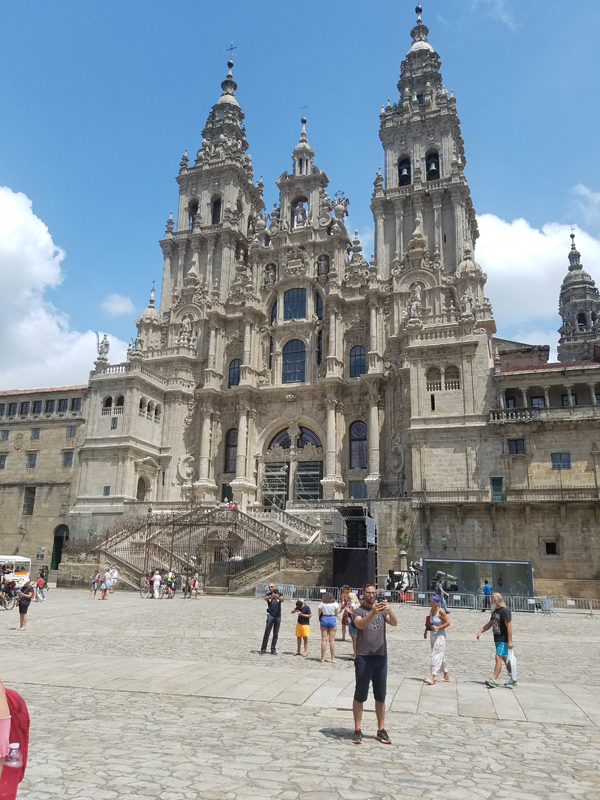 From what I have read in many guidebooks and on Authentic Journeys’ website, it’s at this point along the Camino where the energy is palpable; vibrating rhythms of pulsating anticipation of the journey’s grand finale—the pilgrims’ arrival at Santiago de Compostela! But let’s not get ahead of ourselves because there is much to see along this home stretch to the “field of stars,” aka Compostela. Pilgrim monument atop Monte del Gozo. Photo: © Iriebabel. Standing high atop one of the last summits before Santiago stands two towering pilgrimsdesigned by Jose María Acuña and looking west to the towers of Santiago’s cathedral. 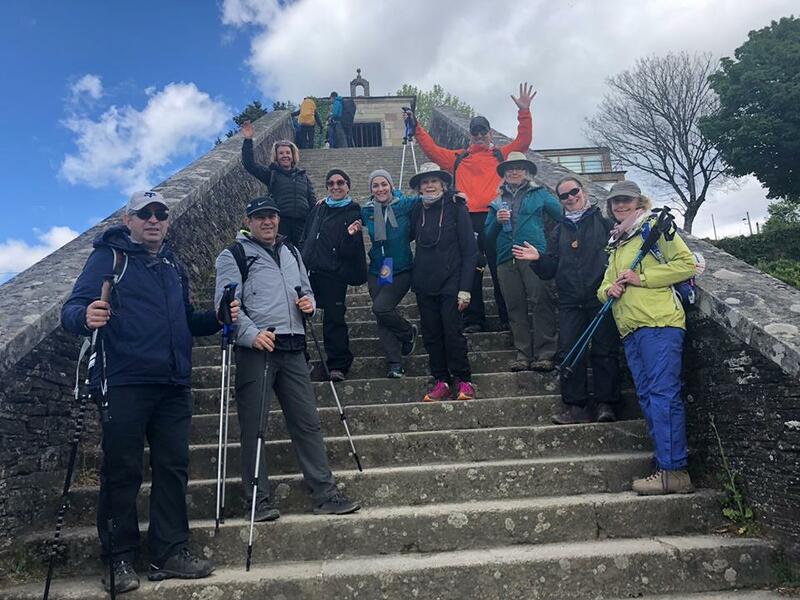 It’s from this point, Monte del Gozo, that pilgrims catch their first glimpse of the end of Camino, the field of stars, the final resting place of the bones of Saint James—Santiago de Compostela. Fresh from its exterior restoration that took place over the last few years, with all the scaffolding removed finally, a sparkling white façade emerged from centuries of grime to shine brightly once again under the Spanish sun proclaiming its return to glory! Pilgrims of average height only reach to the waists of the larger-than-life peregrinos atop Monte del Gozo. Photo: © Iriebabel. Another monument, approximately 1,000 feet to the north commemorates the visits of Pope John Paul II 1993 and Saint Francis of Assisi at in the early 13th century with their likenesses emblazoned upon the pedestal. Crowning the top is the modern sculpture and cross. Just down the hill to the north is an enchanting little chapel, Capilla de San Marcos (Saint Mark). We’re but 3 miles (5 km.) away from the end of our journey. A spiritual finale awaits all weary pilgrims upon their arrival in Santiago at the Pilgrim’s Mass which takes place every day at noon inside the Cathedral of Santiago de Compostela. One of the highlights of the mass that I am hoping to witness is the botafumeiro (incense burner) ritual, a sublime celebration in which a censer, tethered with ropes to an overhead pulley and manned by eight clergymen, is swung from one end of the transept to the other. Higher and higher until it scrapes the ceiling arcades on either side. From what I have seen in movies, read in books and watched on Youtube, it’s an extraordinary feat that is profoundly moving and marks a pivotal moment for the pilgrim. Despite it being the end of the Camino, it’s also a beginning—a renewed sense of self, a new purpose, a new life, a new destiny! In response to a request by Jesus to spread his gospel to all corners of the world, Saint James the Great (Jacobus, Santiago) set out on a mission to the Iberian Peninsula (Portugal and Spain) where he failed miserably. Upon his return to Judea, he was beheaded by Herod Agrippa in 44. As the legend goes, his followers smuggled his body back to Iberia via a stone boat that washed ashore in Galicia. More disciples recovered his body and hid them in an unmarked cave. Centuries later in 814, a Galician hermit named Pelayo looked to the western sky and saw strange dancing lights, stars hovering over the nearby Rue Sar (Sar River) just south of where the cathedral stands today in Compostela. So he followed them to the field of stars. Along the way, a choir of angels sang in concert with the dancing lights and together, led Pelayo to a cave where he discovered three tombs, the middle one beneath a slab of marble belonged to Saint James, one of Jesus’ Twelve Apostles. The other two belonged to two of his disciples. When word of the miraculous discovery finally reached Rome, they declared Santiago de Compostela an official pilgrimage site. It was upon this site where the first chapel was built as commanded by King Alfonso II of Asturias and Galicia, who also happened to be the first pilgrim to the site as well. 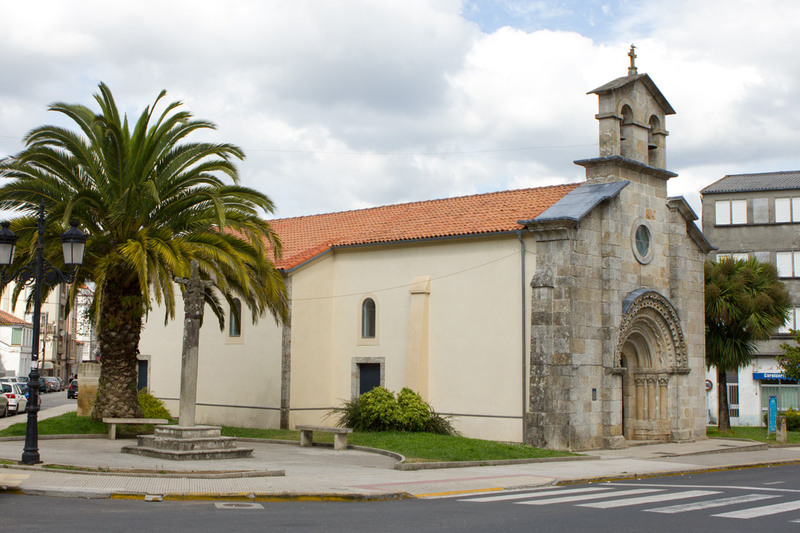 In 830, the first church of Santiago was consecrated by Bishop Teodomiro. 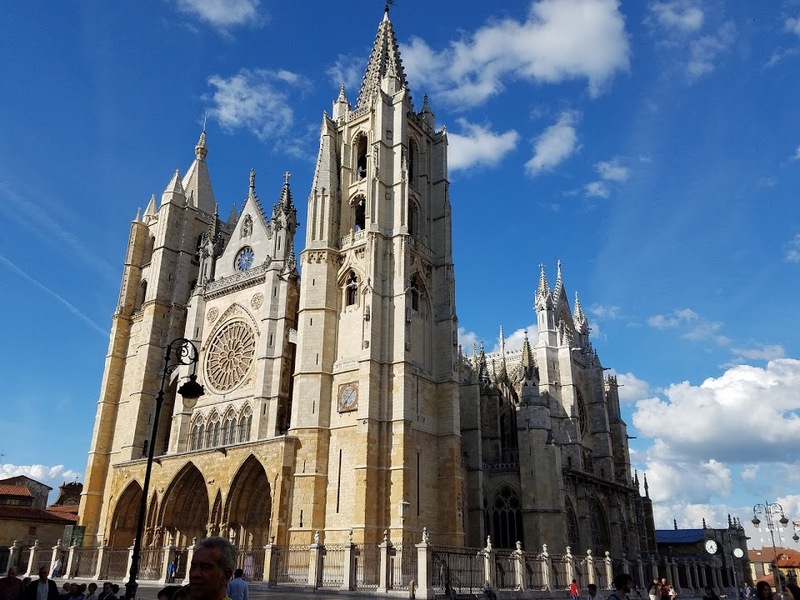 Seventy years later, Alfonso III of León ordered the construction of a new basilica church which was consecrated in 899 however, 100 years later, the church was destroyed and construction on today’s cathedral began in 1075 by Alfonso VI of Castile. Its plan mirrored that of the Basilica of Saint-Sernin in Toulouse and was finally consecrated in 1211 by Alfonso IX of León. Although other embellishments were added during the 16th-18th centuries, its interior retains the earlier Romanesque architecture. Fresh from its exterior restorations, the Cathedral of Santiago de Compostela sparkles brightly under the Spanish sun. Photo: © Barbara Johnston, CC. 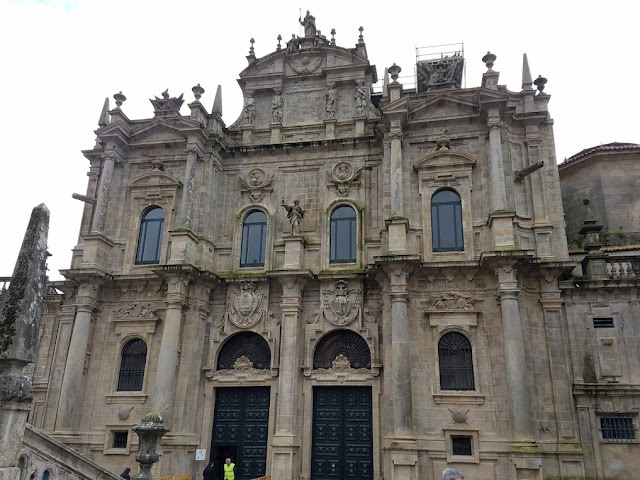 Rising above the Praza del Obradoiro, the cathedral’s Baroque façade, added in the mid-18th century, features a statue of the Pilgrim Saint James presiding over the square and flanking his sides, two pairs of angels holding the cross of the Order of Santiago. 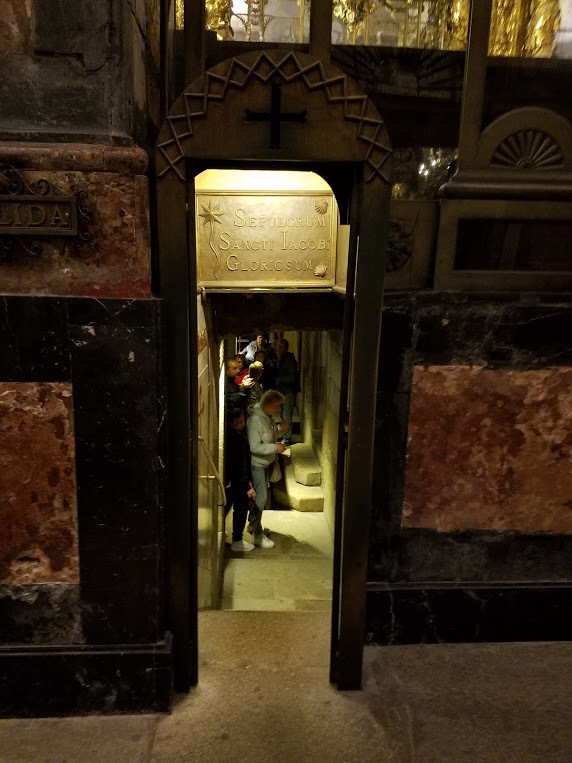 Just below Saint James, his disciples Atanasio and Teodoro protect the urn that represents Santiago’s sepulcher; and in between them, a star that represents the dancing lights that the Hermit Pelayo witnessed nearly 900 years ago. West: Dating back to 1126, the Pórtico de la Gloria (Portal of Glory) welcomes pilgrims through a magnificently carved medieval portal designed by Master Mateo whom I first mentioned above in Portomarin’s Church of Saint John. When the new Baroque façade was added, the Portal of Glory was pushed just inside the cathedral’s western doors. In its central tympanum, Christ sits upon his throne surrounded by the Four Evangelists, each clutching one of the four Gospels. Saint James stands beneath Christ and below him, the Tree of Jesse upon which pilgrims place their hands to express gratitude for their safe arrival. After centuries of pilgrims following in this tradition, an actual imprint of a human hand formed after 800 years. To conserve for future generations, it’s forbidden to place your hand here but you can still get up close and personal to the column. Behind the column is a sculpture of a kneeling Maestro Mateo himself looking toward the altar. As tradition states, pilgrims bump heads three times with the Master in hopes that his genius rubs off and inspires. Portico de la Gloria (Portal of Glory). Photo: © Juantiagues CC BY-SA 2.0 via Wikimedia Commons. North: Puerta Francígena through which French Way (Camino Frances) pilgrims passed into the basilica was destroyed in 1757 by a fire giving rise to the Puerta de Azabachería. The remnants are preserved in the Cathedral Museum. Puerta de Azabachería. Photo: © Lisa Foradori. 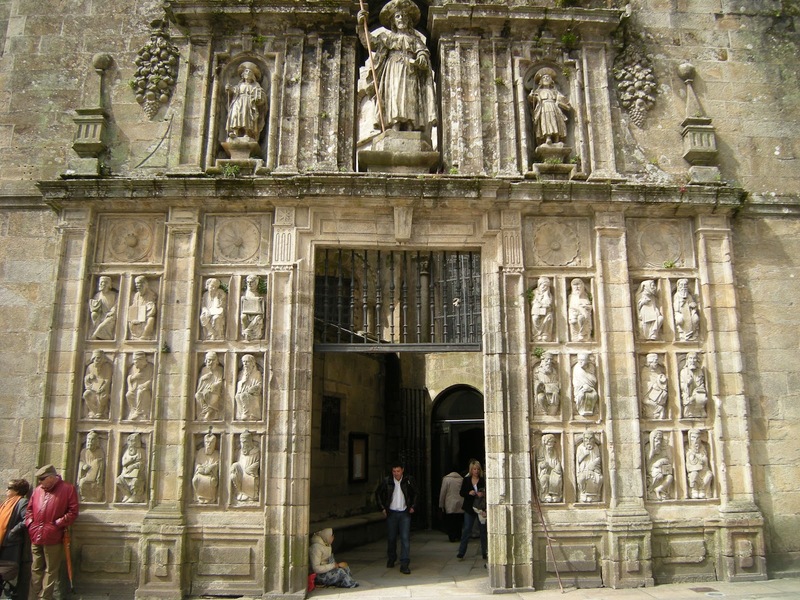 South: Puerta de Platerías (silver) provides access to the Episcopal Palace and has survived to this day with original reliefs from the Francigena door and other works. It's the only portal to have survived intact for the last 800 years. Traditionally it was through this portal that Camino de Portuguese pilgrims would pass to enter the cathedral. Puerta de Platerías. Photo: © Lisa Foradori. East: The eastern facade features two portals: Puerta Santa (Door of Pardon) which is opened only during the Jubilee Years and the Puerta Real (Royal Portal). I discuss the former in more detail below. Puerta Santa or Holy Door is only opened during Jubilee Years. Photo: © José Antonio Gil Martínez. The Altar Mayor (High Altar) is truly a spectacle to behold! A Baroque masterpiece of craftsmanship, the baldacchino (canopy) was erected directly above the crypt and completely finished in gold leaf. Bearing its weight are four larger-than-life angels floating above the altar. Crowning each of the corners are The Four Virtues (Prudence, Fortitude, Justice and Temperance). Additionally, three portrayals of Saint James decorate the canopy as well: Santiago Matamoros, the Moor-Slayer who aided the Christian battle with the Moors; Santiago Peregrino is his finest pilgrim attire including a hat and walking staff with a gourd; and Santiago Apostol, Saint James the Greater, one of Jesus’ original Twelve Apostles peers out from a room adorned in silver and gold. Santiago Matamoros (Saint James the Moor-slayer) rides high atop the Altar Mayor. Photo: © Catedraldesantiago.es. Behind the Altar Mayor, follow the steps up to the golden statue of Saint James and give him a great big hug to express your gratitude for arriving at the cathedral safely. At the bottom of the steps, turn left into the Sepulcrum Sancti Jabobi Gloriosum or the Crypt of Saint James to pray before the silver sepulcher that contains his relics. Sepulcrum Sancti Jabobi Gloriosum or the Crypt of Saint James. Photo: © Lisa Foradori. Before exiting the cathedral, visit the authentic Romanesque Church of Santa Maria a Antiga da Corticela which has survived in its original state for nearly 900 years. Built at approximately the same time as the cathedral, you can see the thick walls, wooden roof beams and narrow windows to let in the light. 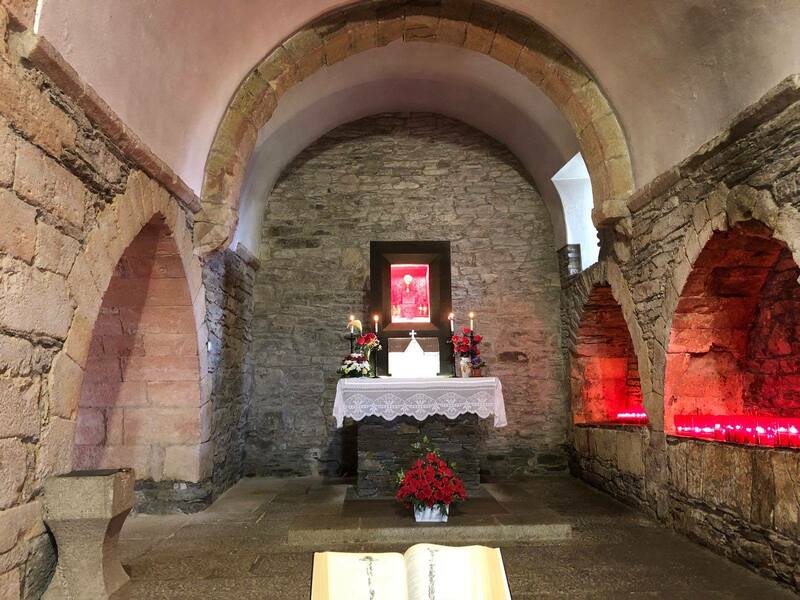 Like many European churches, you can visit the excavations below the central nave and south transept to find ancient walls, tombs and other vestiges of temples dedicated to Saint James. The liturgical texts of Santiago. Written account of the miracles carried out by Santiago along the various routes of the Way of Saint James. Outlines of the events leading up to the transfer of the Saint’s relics from Palestine where he was beheaded in 44 A.D. to the Galicia in the northwest corner of Spain and subsequently placed in the sepulcher. Also known as the Turpin Chronicle, the fourth book traces the path of Emperor Charlemagne’s mission to liberate the paths leading to the tomb of Saint James. Probably the most famous of all the five texts is the Camino de Santiago Pilgrim's Guidebook filled with advice, warnings and helpful tips for medieval pilgrims following the way of Saint James. According to historical accounts, it has been attributed to the French Clergyman Aymeric Picaud. 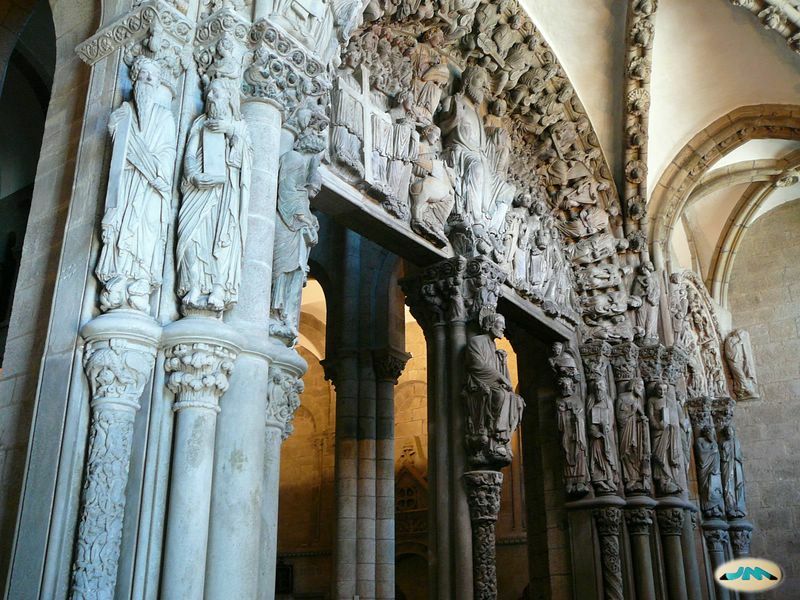 Cathedral Museum below the Portico de Gloria and adjacent to the crypt is a fascinating combination ticket that not only provides entrance to the museum, but to the crypt, treasury and for an additional fee, a rooftop tour for a birds-eye view of Santiago de Compostela. Museo Peregrinaciónes (Pilgrims Museums 1 and 2) are two other museums outside the cathedral that are dedicated to the Camino de Santiago pilgrimage. The latter features a model of the cathedral complex. Museo do Pobo Galego offers visitors a glimpse into Galician culture and traces history back to when Celts occupied the land. When the Day of Santiago falls on a Sunday, it’s declared a Holy Year and the Jacobean Year is celebrated, a jubilee when absolution is granted to all pilgrims. The first event took place in the year 1428 and only during these years, pilgrims enter the cathedral via the Puerta Santa along the eastern façade, mentioned above. The next Jubilee year takes place in 2021. Praza da Quintana (burial ground) along the cathedral’s eastern façade was a cemetery until 1780. The square is actually divided into the Quintana de Vivos (Living) and Quintana de Mortos (the Dead) beneath which a huge necropolis was discovered in 1964. 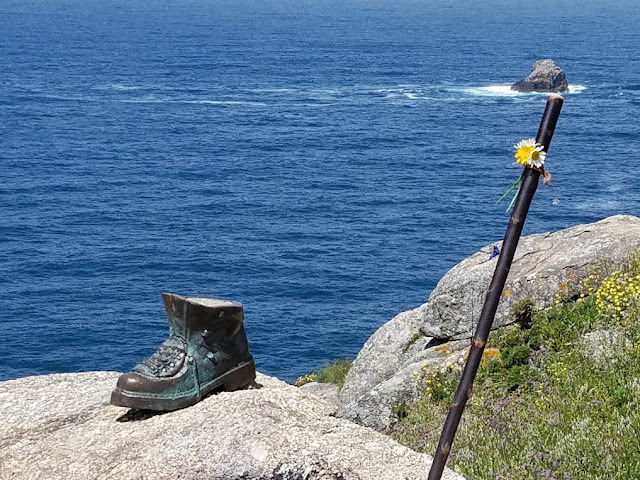 Many pilgrims continue their journey beyond Santiago to the "end of the earth" or Cape Finisterre from the Latin finis terrae. During the Middle Ages, it was believed that this point literally marked the end of the known world. 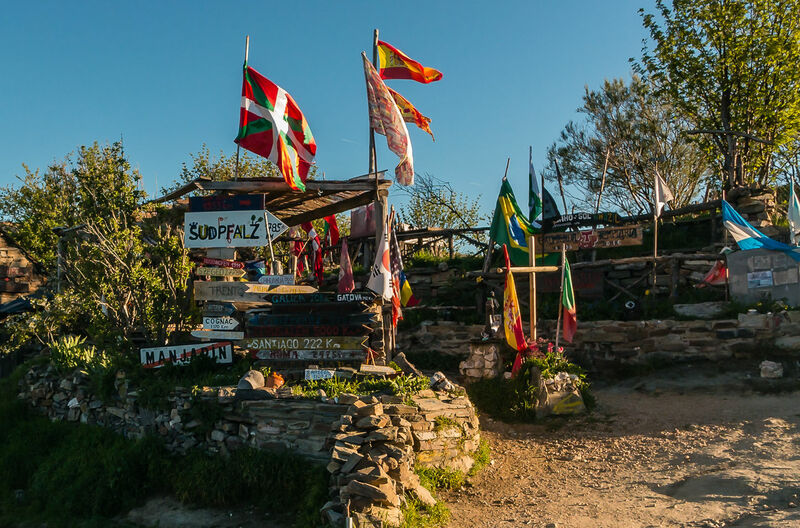 There is also an alternative route to the Atlantic via Muxía to the north, and many pilgrims actually combine both destinations to mark the end of their Caminos. My Camino will take me to the former where the waymark reads 0.00 km. The end of the Camino and the end of the World. Photo: © Lisa Foradori. Holy Mary appeared to Santiago here to encourage him on his missionary journey. According to many of the guidebooks and Authentic Journeys, it is a tradition among pilgrims to burn an article of clothing to symbolize their transformation from the person they were when they started their journey to the person that they have become along The Way. Bronze hiking boot pays homage to the pilgrim's journey and the tradition mentioned above. Photo: © Lisa Foradori. I hope you follow along on my Camino which begins in Madrid, Spain, September 16 with Authentic Journeys. Amazing article! If I hadn’t walk the camino this article would surely make me want to. It was a wonderful journey and it’s always nice to have your writing remind me of why I love it and will walk again next year. Thank you my friend for your kind compliments! I really appreciate it! And can't believe you read the entire post. Thank you!!! And thank you again for the use of your photos!! Couldn't have done this without kind souls like yours! You are so welcomed my friend, I look forward to your next adventure. 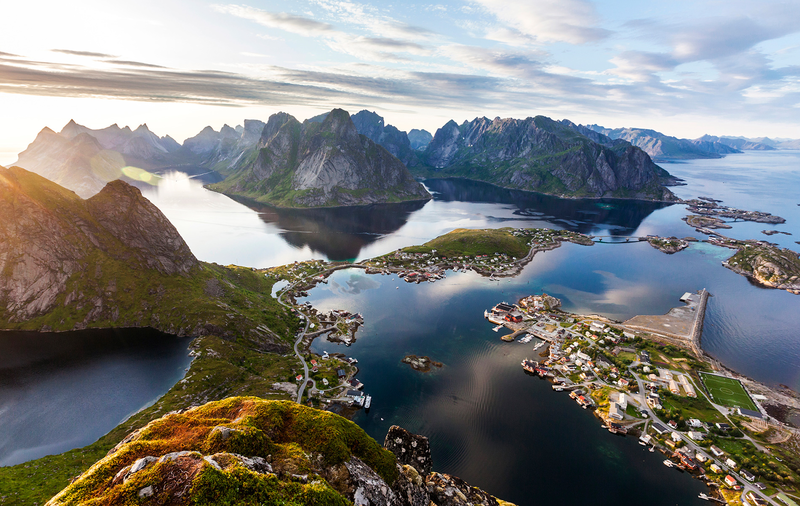 I will definately read your post on Norway , along with others, as it like a second home for me (Bergen). Hope you will keep in touch. 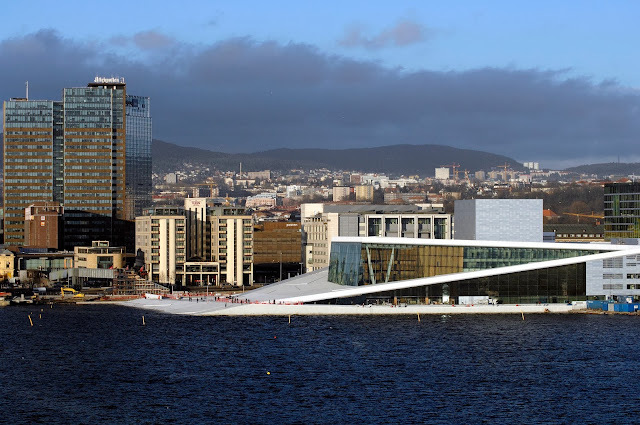 LOVE Norway and yes, Bergen is wonderful!! Need to get back there soon. And don't you worry, I'll be in touch! Thanks again!! I have tears in my eyes as I read about this journey and view these images you are about to experience up close and personal... Have a wonderful experience, my friend. It's a moving journey for sure! I can't wait to surrender to the Camino and open myself to all that awaits. Thank you so much for the comment my friend!! Big hugs! !